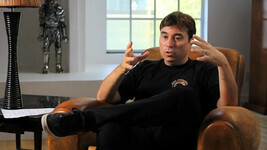 Chris Roberts Live Chat Tonight At 5 PM PST! 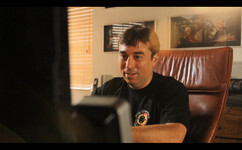 If you can, swing by the RSI site and jump in on the live chat with Chris Roberts. He's conducting another session tonight at 5 pm PST (8 pm EST). He was on for several hours last night answering questions. A brief overview of the chat can be found here. Wing Commander got quite a few mentions throughout the chat and seems to be an area Chris Roberts is looking to for inspiration. 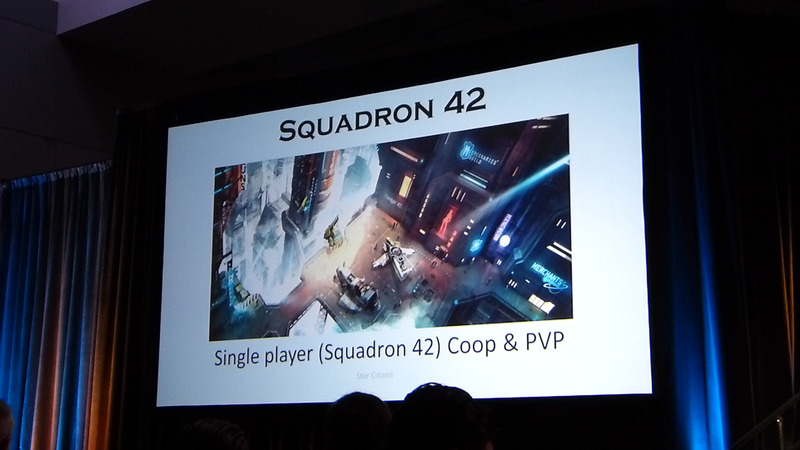 Squadron 42 sounds very interesting for Wingnuts! Wingnuts can access the live chat here. Chris Roberts said he'd be on for about an hour this evening, so if you have a chance, drop in! Penny Arcade talked to Wing Commander veteran Warren Spector about player freedom in solving game puzzles. Check it out here. The way Spector looks at a problem is almost backwards, at least from the typical perspective. He works his way out from the center of the maze or erases walls to make his own way out. “Games to me are about choice and consequence. It’s about me setting up problems, or my team setting up game problems, like you have to get through that door. Why do I care how you do it?” he asked. 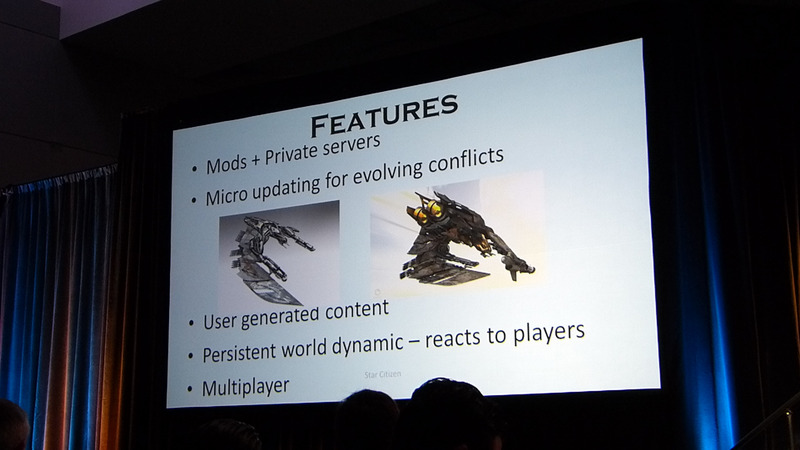 Spector gave an example from Deus Ex. 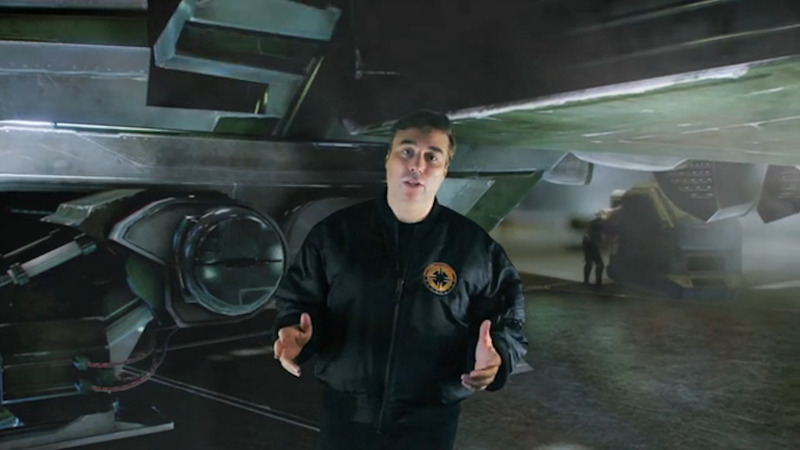 Breaking: Chris Roberts Conducting Live Chat At RSI! 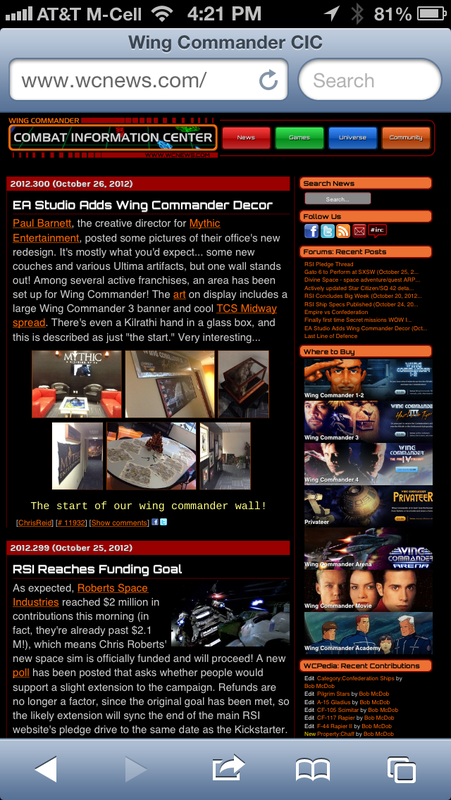 Wing Commander creator Chris Roberts is currently conducting a live chat at the Roberts Space Industries site that wingnuts can access here. More than 150 fans are asking Chris Roberts questions about Star Citizen, Squadron 42 and many other of his classic games. Drop in and ask a question of the man himself! Be sure to check out the latest Update From RSI posted just before the live chat started. We also hope that LOAF, and any other wingnuts on the East Coast, recover safely from Hurricane Sandy and get their utilities restored soon. Update: Chris has logged off the live chat, but promised to be back for an hour tomorrow, Wednesday, evening at 5 pm Pacific Standard Time. Plywood Fiend has started a series of video reviews for the episodes of the Wing Commander Academy television show. He covers episodes' plots and hits on a number of discussion points. After incorporating feedback on the first video below, an expanded feature of the second episode was posted here. Let PF know what you think and help him improve future episodes at the CIC Forum! Wing Commander Academy is available at Amazon.com for $19.99 here. Sharp-eyed readers have noticed that Amazon has sold out of and received additional batches of the set since it was originally released in May. Unfortunately, Target has sold out, but Deep Discount has a pretty good price at around $17. It's already been said many times online, but we'd like to wish everyone in the path of the Superstorm Sandy good luck this week. Several CIC staff members and hundreds of our regular readers are currently in the storm's path, but fortunately the worst things we've heard so far are just power outages and minor damage for Wingnuts in the affected area. Stay warm and dry out there! Blake Robinson has put together a "synthetic orchestration" of the original Wing Commander theme music. The track retains the original's character while adding a nice richness to it. Blake has done a number of reorchestrations for other game series, such as Gears of War and Resident Evil. You can listen to the new WC creation below or grab an mp3 at Soundcloud here. Thanks to MannPower for spotting this one! The XBox dashboard was updated again this week, and among the new features is a full Internet Explorer app. IE has had the most issues with the ongoing CIC layout redesign, but I'm happy to report that wcnews.com shows up very nicely on the XBox! If you haven't tried it yet, the new site also looks pretty good on a variety of phones and tablet computers. 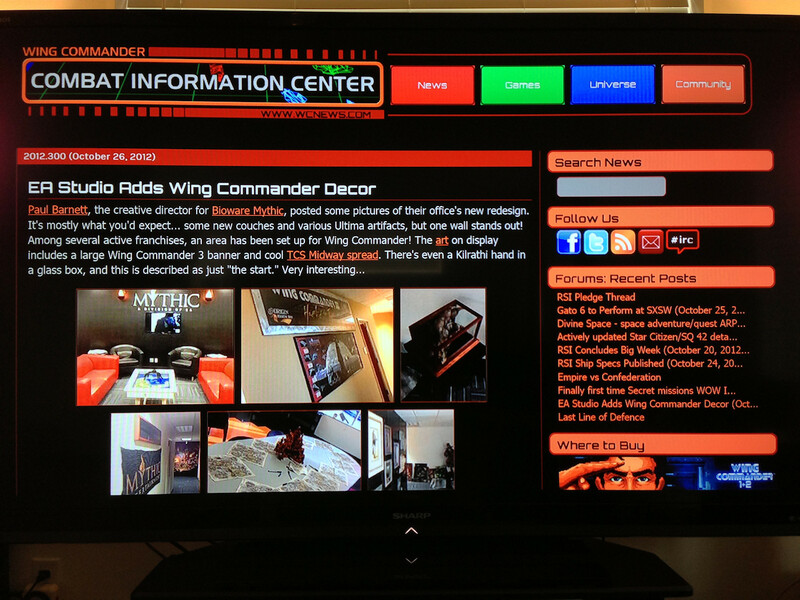 Wing Commander themes for your XBox 360 are still available for just 50 Microsoft Points, about $0.75. RSI Stretch Goals Announced, Everybody Gets a Robot! 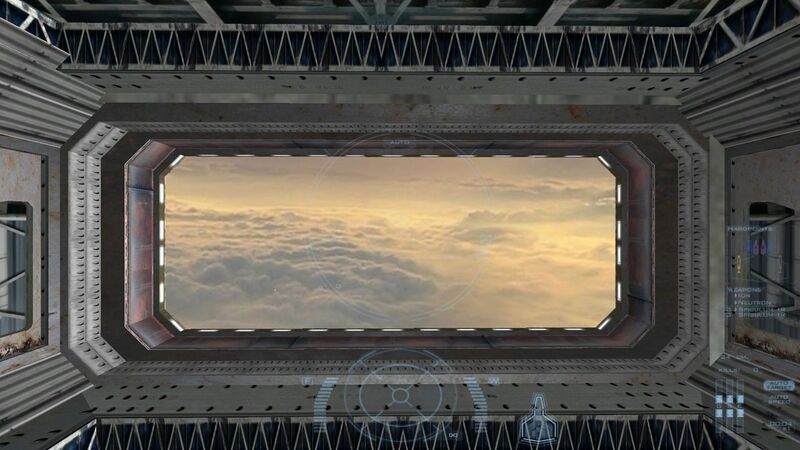 Roberts Space Industries has announced its comprehensive set of stretch goals for the remainder of their funding campaign. The project is now past $2.25 million dollars with the main site and Kickstarter combined, and there are now specific items that will become available in the final game at each $500,000 milestone. 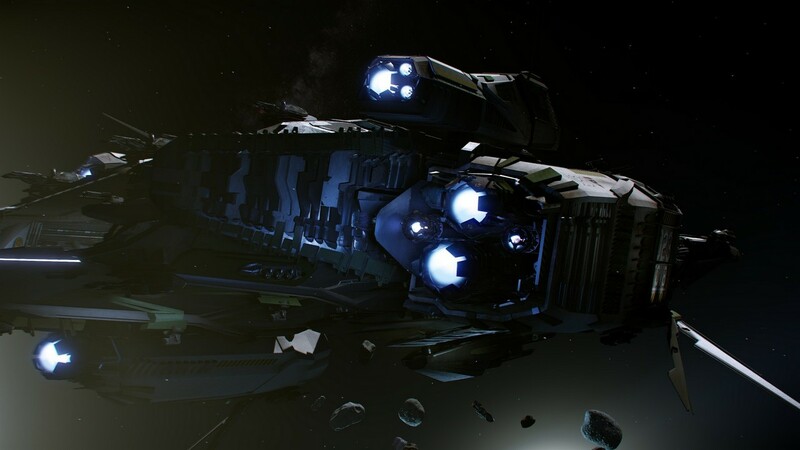 $2M unlocked the primary Squadron 42 campaign, and $2.5M unlocks a sixth starter ship. 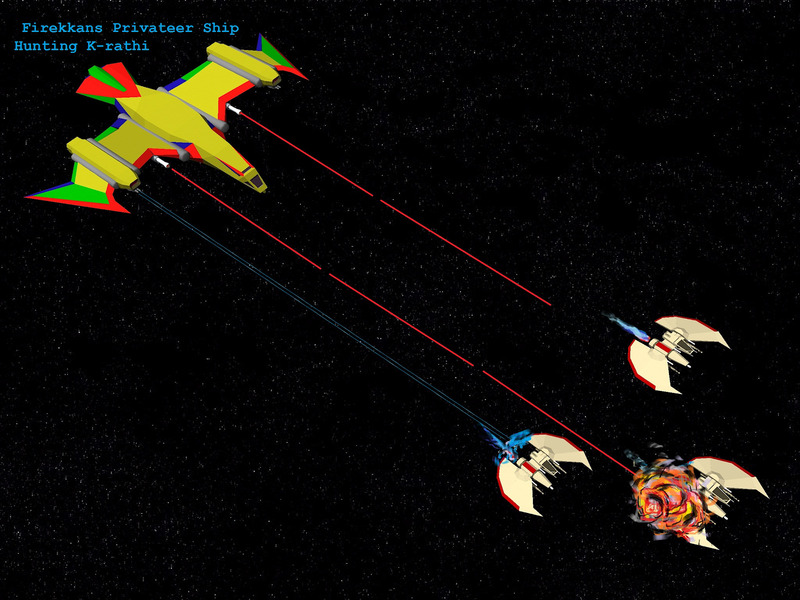 $3M unlocks the persistent universe with "Privateer-like gameplay." Check out the full list here, and note that some tiers are secret until later on. A bonus set of stretch goals has been posted specifically for the Kickstarter. These open up extra rewards for certain pledge levels that are reached over there. In just over $50,000, the KS will reach $750,000, which unlocks a "class I repair bot" for all supporters. At $1M, each contributor gets 500 extra credits and the ability to pilot corvette size ships. It's a pretty interesting and engaging setup! Finally, the end date of the main site's campaign has been sync'd to the ending of the Kickstarter, which means fans have until November 19 to pledge and help unlock these bonuses! Initial Goal – $2+ million Pledged – MISSION ACHIEVED! Check this one out at the $5 million level! 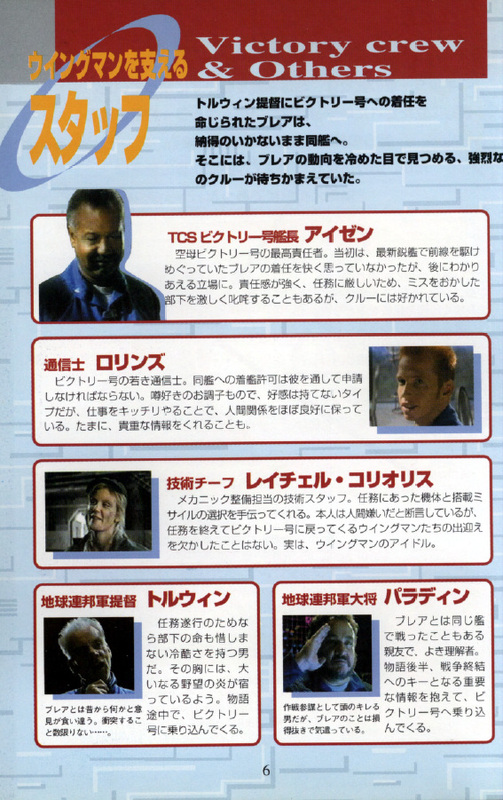 "Celebrity voice-acting for Squadron 42; we will bring back at least one favorite from Wing Commander!" 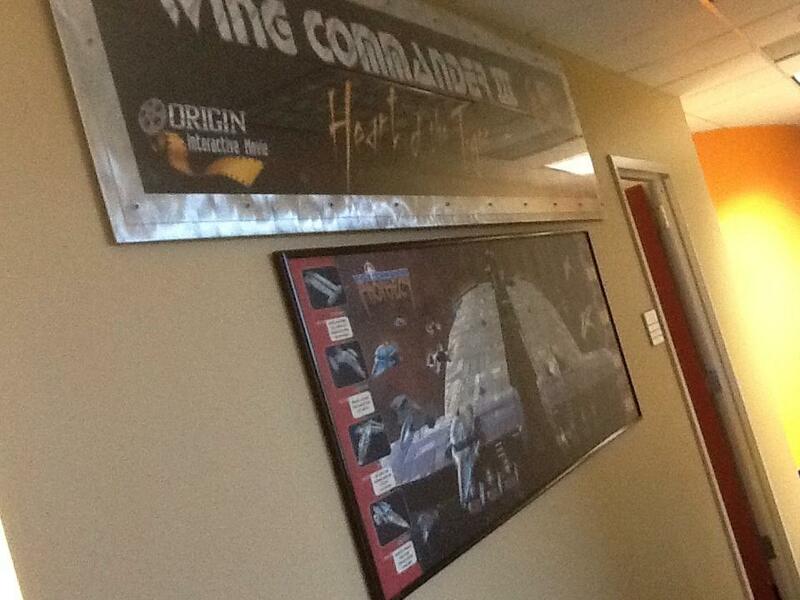 The start of our wing commander wall! As expected, Roberts Space Industries reached $2 million in contributions this morning (in fact, they're already past $2.1 M! 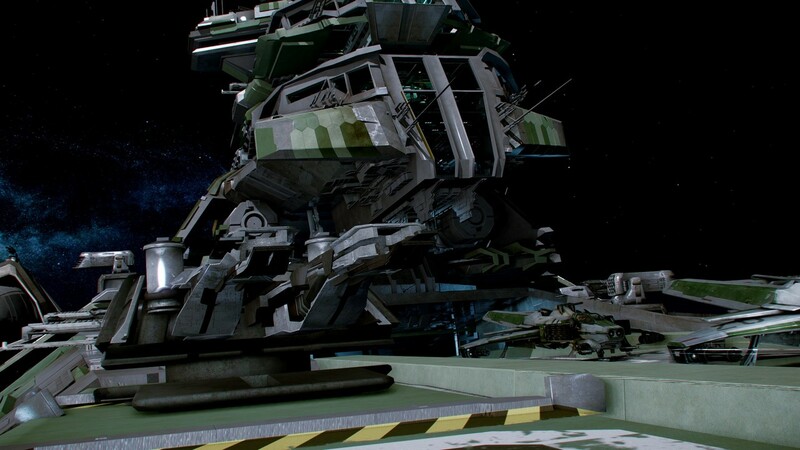 ), which means Chris Roberts' new space sim is officially funded and will proceed! A new poll has been posted that asks whether people would support a slight extension to the campaign. Refunds are no longer a factor, since the original goal has been met, so the likely extension will sync the end of the main RSI website's pledge drive to the same date as the Kickstarter. This would give it about ten more days with a conclusion on Monday, November 19. 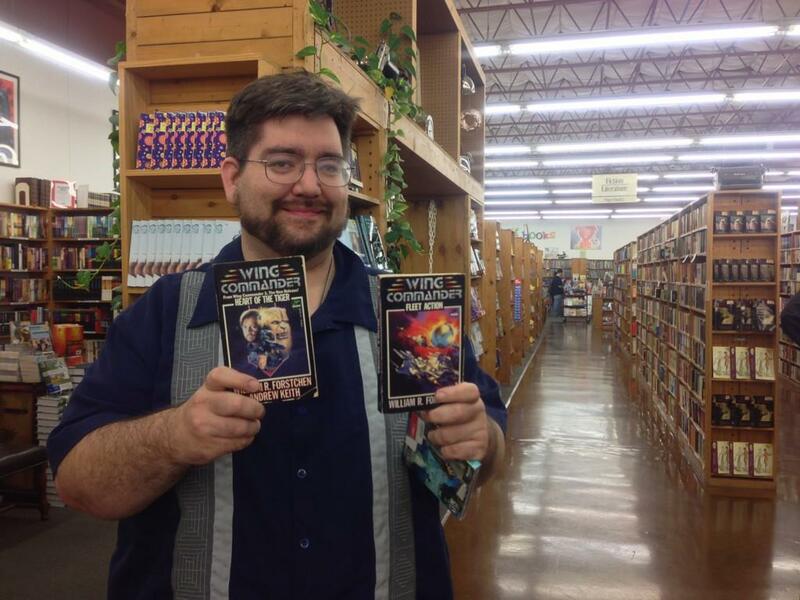 Wing Commander 3, 4 & Prophecy composer George Oldziey has announced that he will be featured at South by Southwest next year. Congrats! 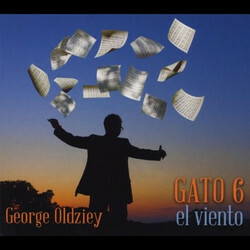 If you'd like a preview of what to expect, check out his new album, El Viento, at Amazon, iTunes or CD Baby. It's a fun listen! I just found out that my band, GATO 6 has been selected to showcase at the premiere live music festival in the world, SXSW (South by Southwest) in Austin, TX this March! We are of course thrilled! Deathsnake has some impressive new shots for the Wing Commander Last Line of Defense mod. The first few reveal some impressive scenes in a nebula and down in a planet's atmosphere. You don't see that sort of thing very often! 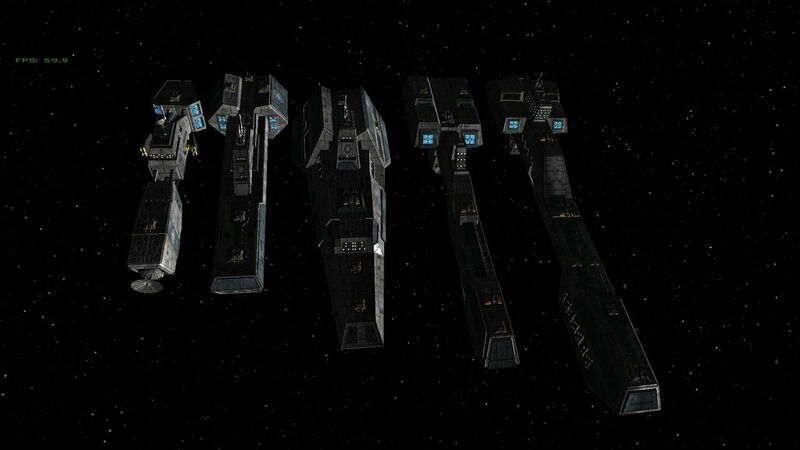 There's also a new lineup of the game's Confed capital ships, and a basic setting for the game's story is below. If you have feedback or would like to help, find out more at the CIC Forums. 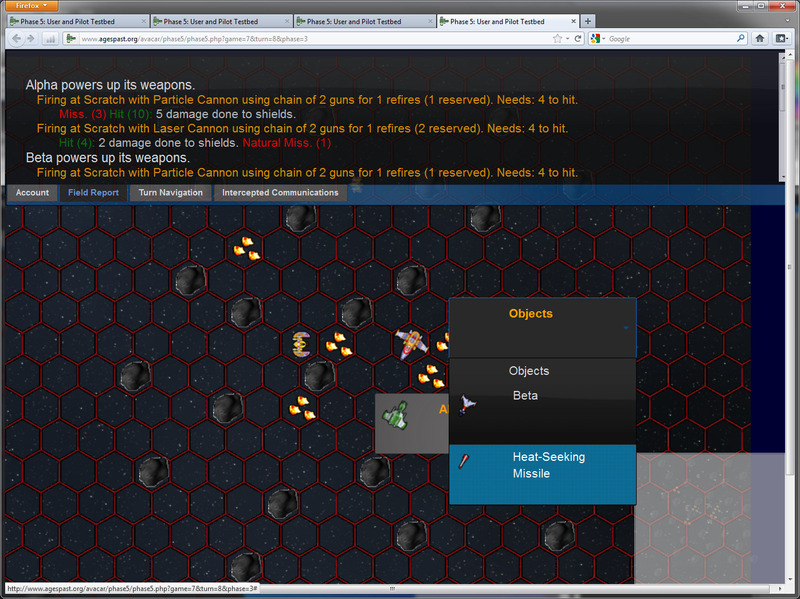 On your homeworld in the Hawking Sector, you are too far away to help in the Battle of Earth. 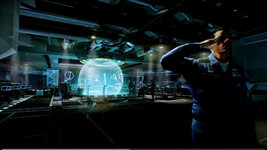 After the battle, you arrive a few weeks later at a fleet outpost in Enigma Sector. The job of Battlegroup 75 is to save as many people there as possible. 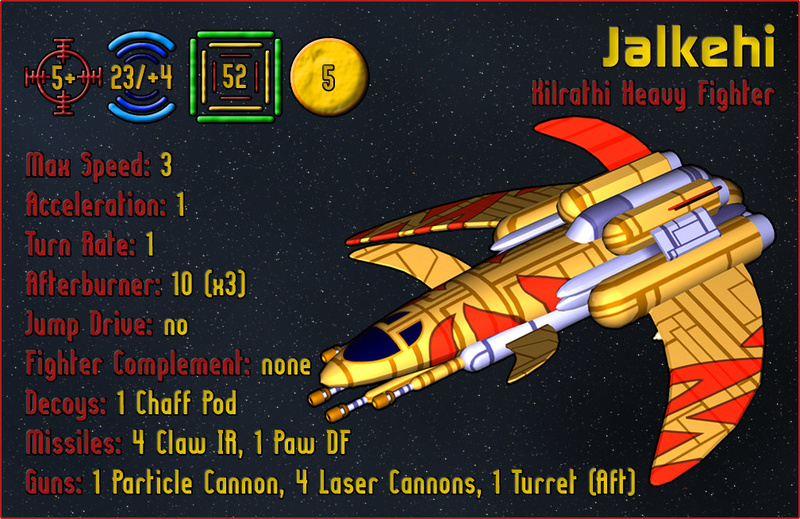 Ras Nar'Ghar, the commander of the Hvar'kashik, wants control of Enigma. 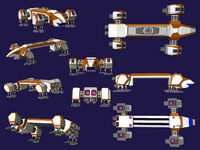 He rebuilt a new station in K'tithrak Mang and has a fleet under his command. 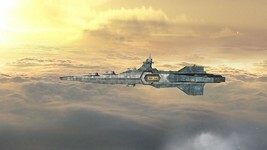 You have only a few ships to hold Enigma, as the others are needed in Vega or in the fleet to protect Earth. Chris Roberts has posted a new note to update fans on his new game's pledge campaign status after two weeks. As of Wednesday night, the combined tally stands at more than $1,950,000, which means the $2 million milestone will be met Thursday morning. 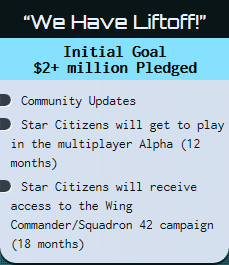 A detailed list of stretch goals and what players have to look forward to at higher funding levels is coming tomorrow. As I write this we are less than $50,000 from reaching the RSI goal of $2 million in overall pledges that makes Star Citizen a “go”. It’s unbelievable. I’m proud to represent this cause and I’m tremendously humbled by the incredible community that has rallied to my side. Not just the donations–which have been astounding –but also the stories and the creativity I’ve encountered interacting with you in the comments and on the message boards and elsewhere. Like me, you have all seen Star Citizen, no matter what you may have called it, in your head for many years… and thanks to your collected efforts; I’m going to build it for you. Pledge upgrades have also finally gone live at the main site. Supporters can click "Upgrade" next to their pledge under "My Account" to increase their contribution. Additionally, new $60 and $120 "all digital" tiers have been opened up, plus several "add ons" are now availble. The add ons allow fans to supplement their existing pledge with all of the other available ships. 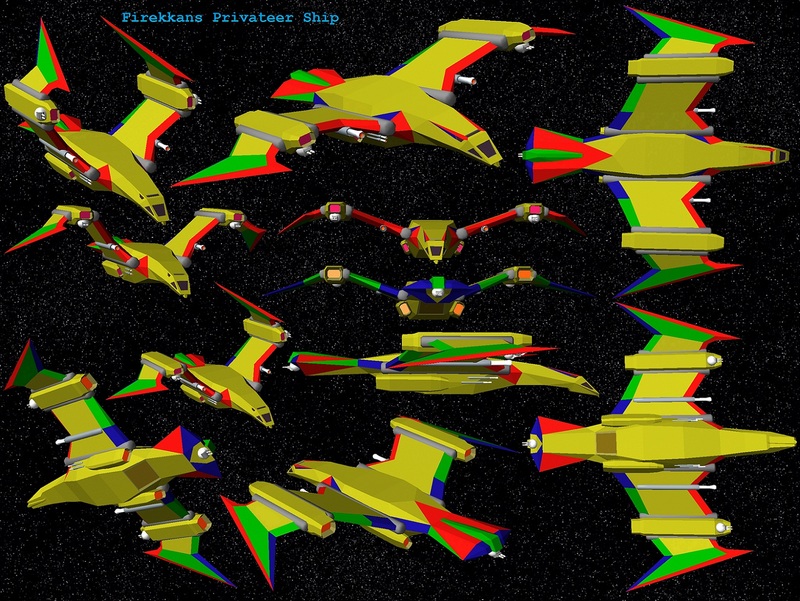 Finally, a new $2500 pledge level (titled "In the Distant Future...") has opened up, and it includes all five ships on top of other goodies. 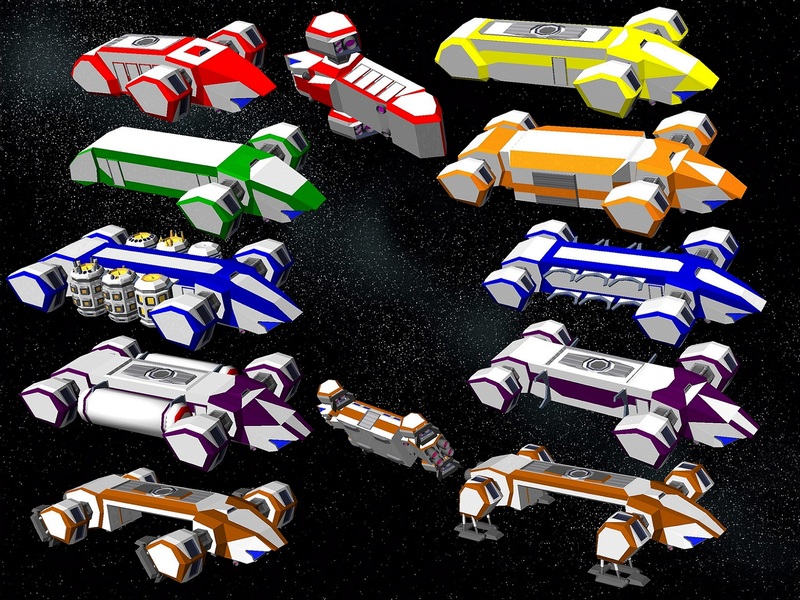 In order to help decide which ships to "add on," Roberts Space Industries has published a very elaborate ship design document. It details the game's five starter ships plus how engines, upgrades, hardpoints and weapons will work. There's so much information that a simple summary doesn't do it justice. 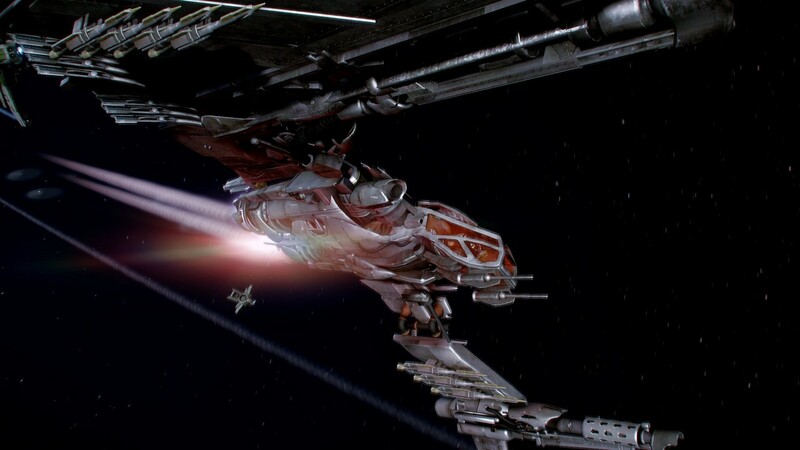 One cool aspect is a quick comparison to familiar sci-fi ships. The Aurora is like the Privateer Tarsus or Straith, the 300i is comparible to the Centurion or Icarus, the Hornet is akin to the Stiletto or Freij, Freelancer to the Galaxy or Gea Transit, and finally, the Constellation is on par with the Paradigm or Salvia. Learn more here! Roberts Space Industries has a couple interesting new articles on its website so far this week. Meet Martin Galway kicks off a series of features on the Cloud Imperium Games team currently working on Star Citizen. Mr. Galway has a extensive history in game audio, including roles as sound director on a number of Wing Commander games. He has also worked on classic Commodore 64 titles, many different Origin games, the Star/Freelancer titles and the WC Movie. 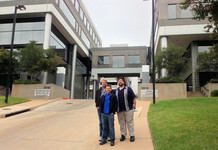 After a few years at Ocean Software carving out his legendary status as Commodore 64 musician,Martin came to Austin in 1988 as a contractor, to help develop Times of Lore; two years later he returned permanently to take a job as Origin Systems’ Audio Director. From then on he was responsible for increasingly complex audio projects including sound effects, music and, as the Soundblaster took the market by storm, speech. 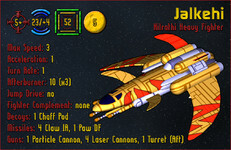 Sharp-eared Wing Commander fans may recognize his voice as a Kilrathi in the original Wing Commander II demo! 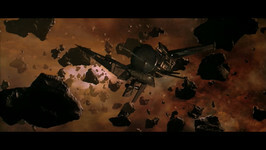 Martin’s audio work at Origin would go on to be an instrumental part of Strike Commander, Wing Commander III, Wing Commander IV and others. 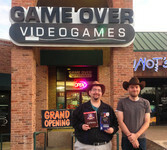 He headed up content creation on Origin’s first CDROM game, a port of “Ultima 6″ to Fujitsu’s FM-Towns PC. To hold all the digital speech samples for the game, Martin’s PC had the largest hard drive in the building at that time - a whopping 320MB. Combined with former Origin composer George Oldziey, there's absolutely no doubts that the new game will sound amazing! 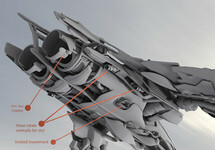 RSI has also published details on potential enhancements that may be coming to RSI's ongoing funding campaign. A poll has been set up to gauge people's interest. There are some neat options! Check them all out here (note the poll may have technical issues at this time - check back later to cast you vote). More smaller “addons” like the electroskin – we threw in the “double pledge” electroskin when we started Kickstarter as a cheap way to reward users who perhaps had a Kickstarter account but had already backed us through the main site. There was some worry that it might seem like we were taking advantage of your generosity… but the users have spoken and they love the skin! Would you like to see more small addon options in this same class? 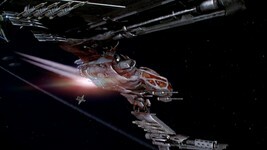 Naming rights for star systems, ships, etc. – this is something a lot of crowdfunding campaigns do with their higher tiers an which we have shied away from. 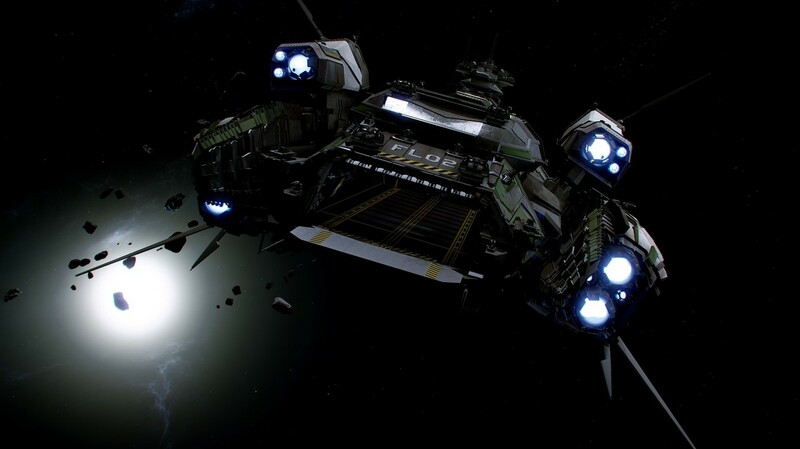 Do you want to spend money to name planets and bases in Star Citizen? More options in the $1,000 to $5,000 range – it’s a big jump from $1,000 to $5,000! Would there be interest in perhaps $2,000 or $2,500 tiers? What would you like to see at this level? Shirts! 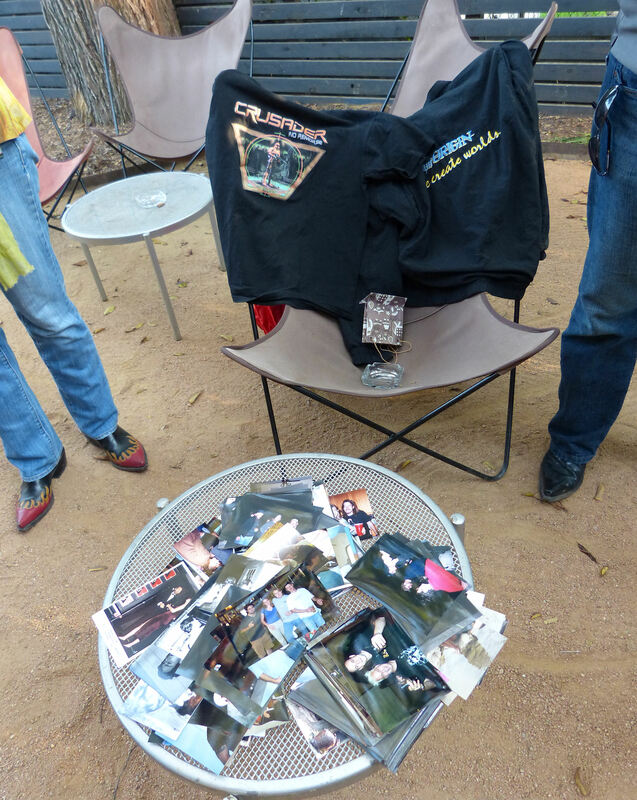 – the reason we created the “Citizen Card” reward was because we thought users might be tired of the standard ‘backer’ shirts that come with nearly every Kickstarter. But from the comments it sounds like shirts are a beloved tradition and we may have missed the mark switching the for the cards. What do you think? The pledge drive is now just a few thousand shy of crossing $1.8 million! 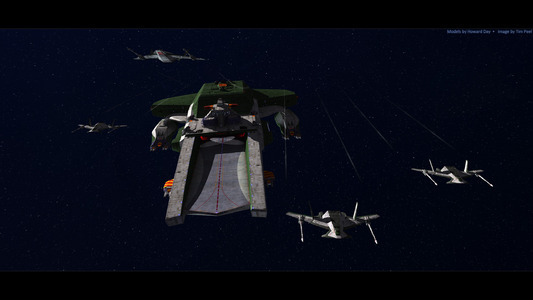 andy_herbert: Which is your favourite Wing Commander, or Wing Commander-alike game? My personal favourite is Privateer :) Many thanks for literally years of enjoyment! CommanderRoberts: WC1 & WC3 are tied for different reasons. WC1 is probably the most perfect game I'e ever made in terms of matching the vision in my head to what the finished game was. WC3 is my other favorite as its where I think we perfected the combining the story with the action i a big cinematic way. CommanderRoberts: Yes there will be boarding parties in both Squadron 42 SP game and Star Citizen's persistent universe. 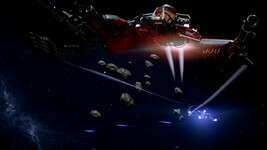 You'll be able to capture bigger ships, or perhaps an asteroid base or space station. mprey: Care to share a few thoughts on your experiences in the film industry? How do you see the Wing Commander film, and how did you get to co-producing films like Lord of War? Are you still involved in the industry or strictly focusing on your new game now? I'm giving film a break for now and am fully focused on building SC as it represents everything I love about games or movies - universe building! 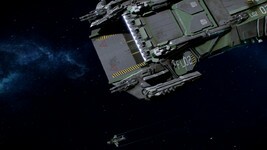 MasterWandu has put together a tribute video titled "Wing Commander Through the Years" that chronicles some of the highlights from each of the main Wing Commander games and then teases some of the video that's been released for Star Citizen. Check it out here and let Wandu know what you think at the CIC Forums. Some of the material is sourced from Holovids, which is the CIC's movie repository. 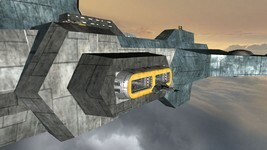 Check it out for all your Wing Commander video needs! Please check out my Wing Commander through the years video: a mashup of Wing Commander I, II, III, IV, Prophecy and the new Star Citizen: Squadron 42 trailer from Chris Roberts! I just wanted to help create something to keep up the momentum and interest in the new Chris Roberts franchise! The timings to the music are not perfectly in sync, but good enough for now. I'm no editing pro, and so it took many hours to source the footage (screen capture with DosBox/ wcnews holovids / youtube) and to get all the timings right! Would appreciate your comments and throughts on the vid. Let's really try and keep up the awareness on all our social channels! Chris Roberts' AMA session on Reddit is happening right now. Sign up for Reddit and ask your questions here. If you want to see just Chris' answers, you can find those at http://www.reddit.com/user/CommanderRoberts. Update 1: Reddit is down intermittently. Too many space sim fans or just a coincidence? The company website and Kickstarter are doing fine. Update 2: @redditstatus "The site is down right now. It appears to be a network-related issue. We are investigating"
Update 3: Still slow but improving. 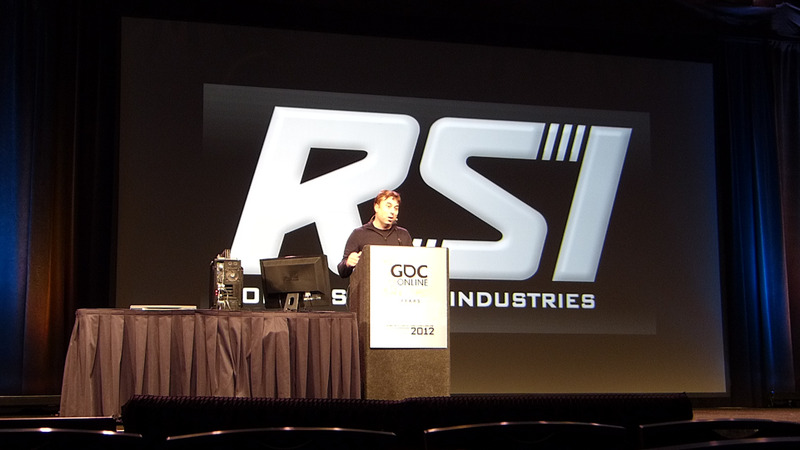 Tune in today starting at 10 AM PST (1 PM EDT, 6 PM GMT) when Chris Roberts will be doing an AMA on Reddit. AMAs, which stand for “Ask Me Anything,” are a chance for Reddit users to interact directly with interesting figures. In the past the subjects have ranged from ordinary people with unusual jobs all the way up to a recent chat with President Obama! 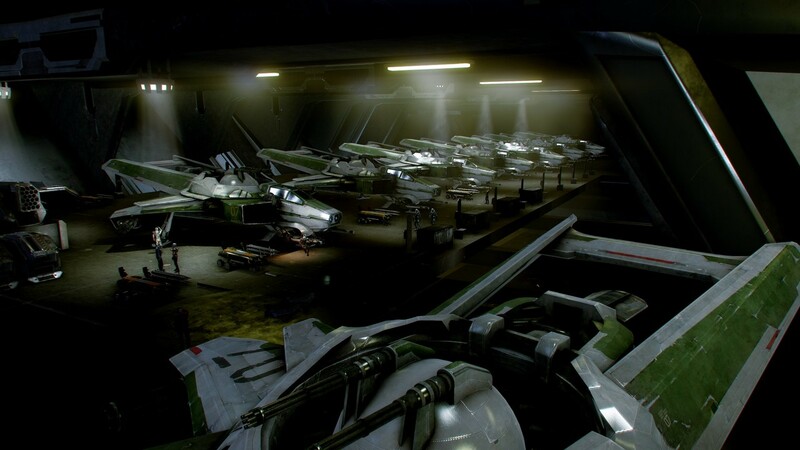 Reddit has been very supporting of Star Citizen already and we’re hoping that Chris’ session will help get word out about the crowd funding even further. So register an account and get ready to grill Chris about Star Citizen! Roberts Space Industries has posted a fun video from the October 10 announcement event at GDC. Several Wing Commander fans are interviewed about their experiences with Chris Roberts games and what they're looking forward to next. A few CIC staff members even pop up in various scenes. 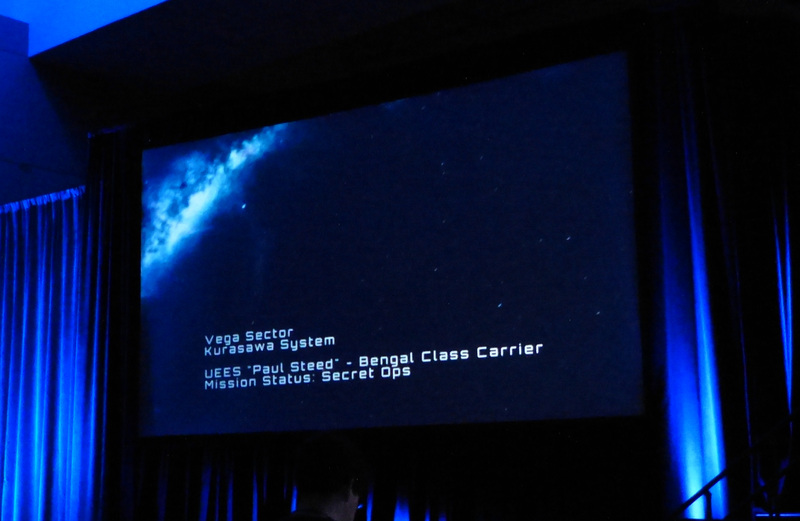 There's also some cool shots in and around the ballroom where Mr. Roberts announced Star Citizen. Check out the video below! 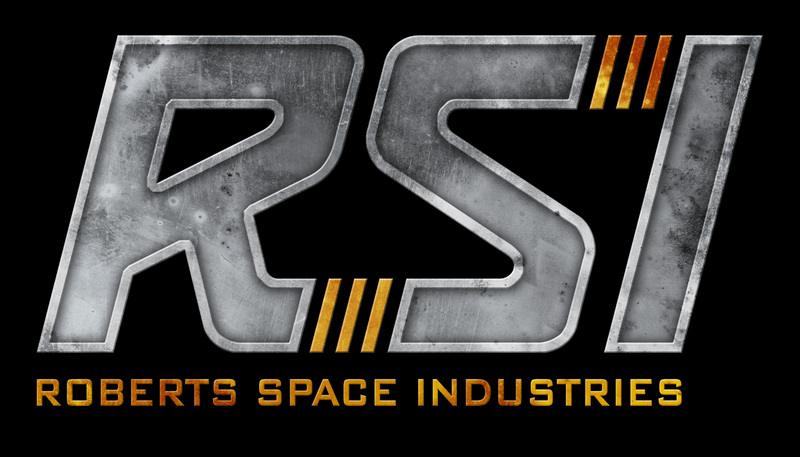 In other RSI news, Chris Roberts will be doing his Reddit AMA starting Monday, October 22, from 10 am Pacific time through 5 pm Pacific time. Stop by and ask him stuff! The pledge drive has also reached $1.6 million! 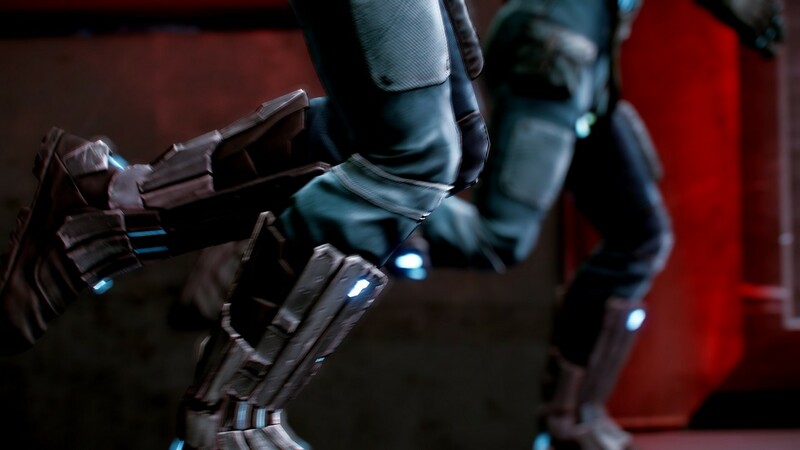 Wingnuts can't seem to get enough of the Squadron 42 cinematic trailer, and several dedicated fans have found even more connections to Wing Commander. 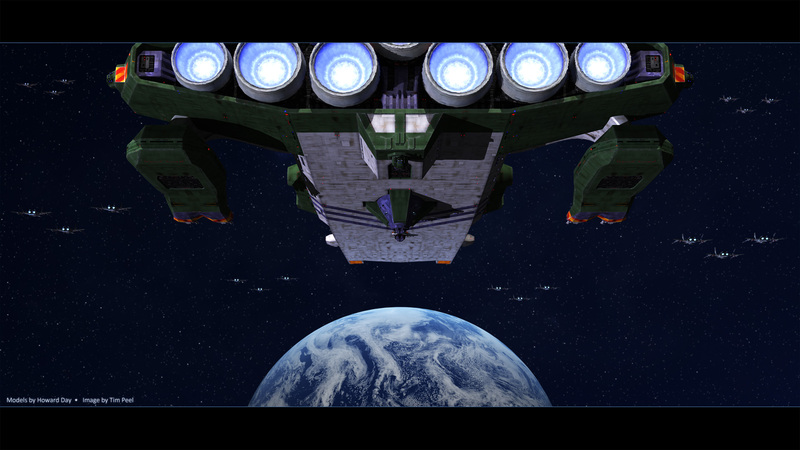 The first shot below draws a nice parallel between the Strakha strike on the Tiger's Claw during the Wing Commander 2 intro and the sneak attack on the Paul Steed. Thanks to No Remorse for grabbing the screenshot. Fortunately, at least one Bengal class carrier survived these encounters! 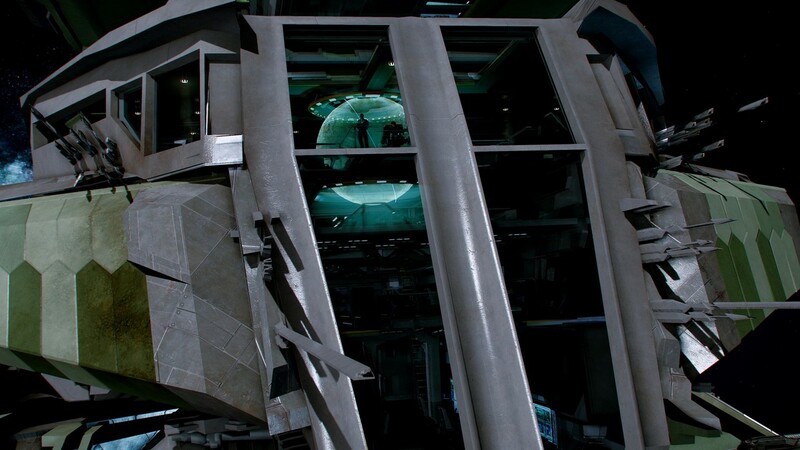 Death Angel noticed that this next image reveals the crewman who salutes us on the bridge is named Blair! Jetlag got a very close-up zoom of the patch reveals that although they're extremely similar, "Terran Confederation" has been replaced with "United Empire of Earth." The bottom portion of the patch still says "Unified Space Command" underneath a Confed logo. And finally, Wikingertux somehow managed to catch the exploding enemy ship right at the point where its pilot was being ejected. The "Vanduul" inside bears a striking resemblance to a Kilrathi, complete with Movie-style pilot armor! Kudos to all the fans with an amazing eye to detail and for Chris Roberts for including all these neat clues in the trailer. What else is out there to find?! 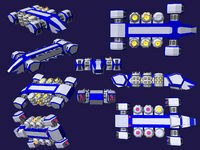 Cybot has a sequel to his shuttle posting with another compact design. 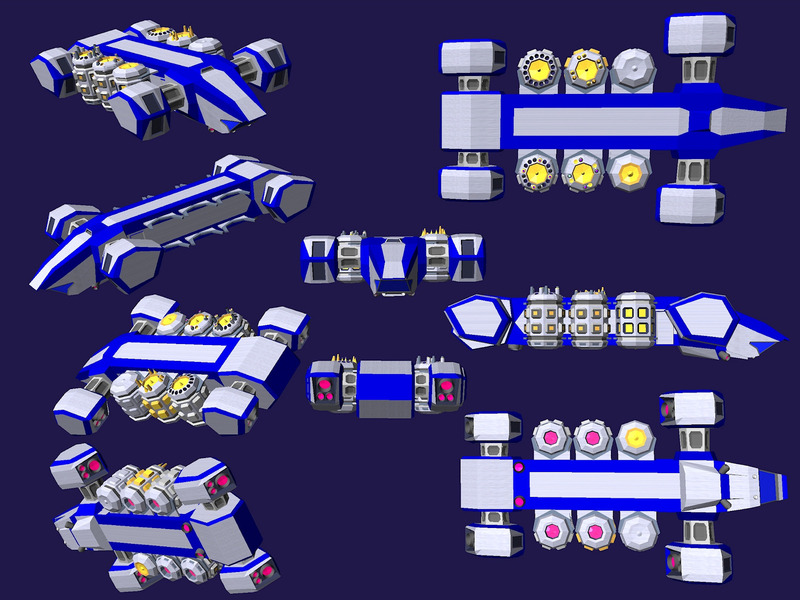 He's created several highly modular variants of the Condor SAR-23 refueling ship. You can grab it for your aspiring fan project at the CIC Forums here. Who was a little surprised that each of these got their own proper "TCS" name in Prophecy? It's been a huge couple of days for Roberts Space Industries! Initial response to the Kickstarter has been phenominal with over $300,000 raised in just 54 hours. At the same time, RSI's pledge site crossed $1.2 million for a combined total over $1,500,000! Five dedicated fans have even pledged for the $10,000 category. The main page has started to sell out of certain slots, including the $30 "First Responder" and $1000 "The Stars My Destination." It is still currently possible to contribute these amounts via KS. The Star Citizen FAQ continues to expand, but a number of questions have been answered on forums or via social media. Here's a couple answers to things we've heard people asking about. Don't worry. 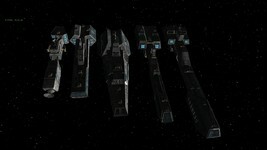 You don't have to trade in your ship - you can have multiple ones at the same time (but only fly one at once of course). 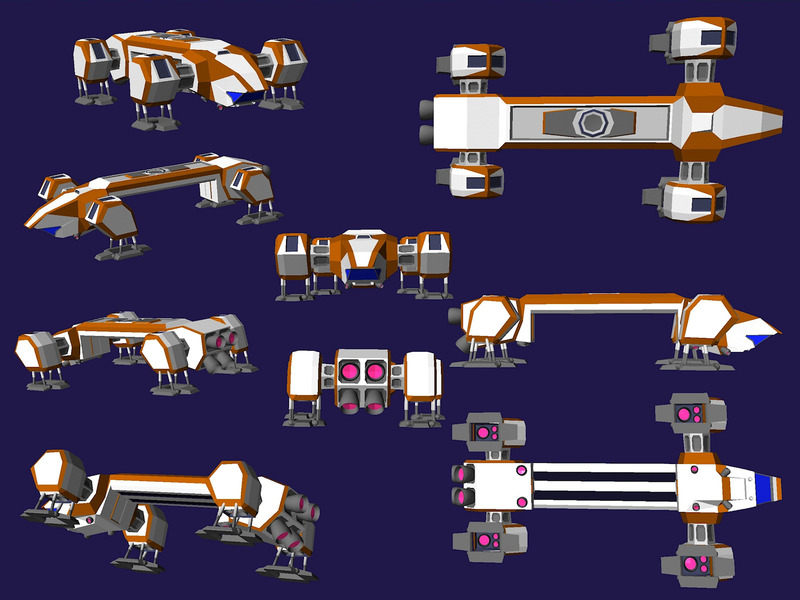 I was just using this an example of a possible upgrade if you wanted a different type / style of ship than the one you start with. I fully expect players to go both ways - some will collect all the ship types as a goal, and some will be more concerned about hone one ship into the perfect fighting / trading ship. 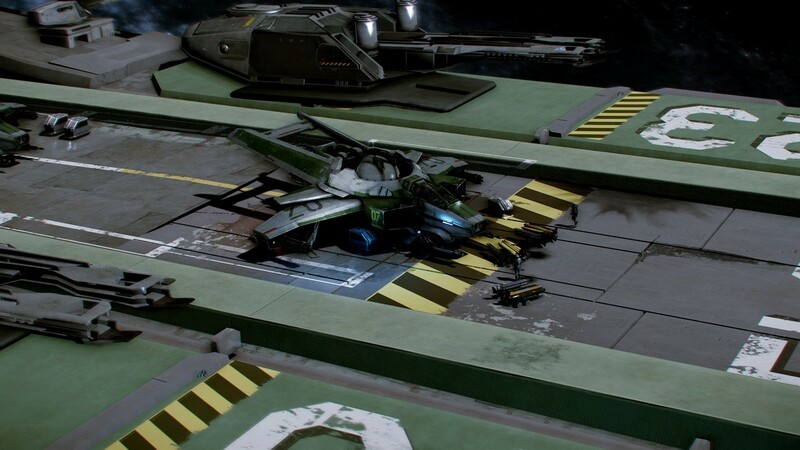 So on the "double" backing - if you pledge for say a SCOUT package and then get a WINGNUT Package - you will have both ships in your "space" garage, your credits will be pooled and you'll get all the physical rewards promised in each package. Its not technically correct that you don't lose your pledge ship - you do. BUT all pledge ships come with lifetime insurance, as opposed to the ones you can purchase in game. So when your ship is destroyed you'll get rescued and returned to the nearest friendly base / planet and will have your ship minus its cargo and any upgrades you bought along the way. You can purchase insurance in-game for upgrades, ships & cargo (think Loyds of London). I'm really wanting to model a "real" world situation. So just like in the real world you're not forced to buy insurance - if you're in the safe parts of the empire you probably don't need it, but if you're trading in areas that you can be attacked by pirates its probably a smart thing to have - but its always your choice. The concept is that in the safe parts,where there is heavy law enforcement you pay landing tariffs and taxes on the goods you sell - to pay for the infrastructure and law and order. But on the outer part of the galaxy, that doesn't have law and order and therefore will have pirates & PvP there are no tariff or taxes and therefore greater profit. But also greater risk. By modeling a full ecosystem like this I hope that different sets of players gravitate to different roles and take different amounts of risk. Some will hie others to take risk trading runs, others will gravitate to it. 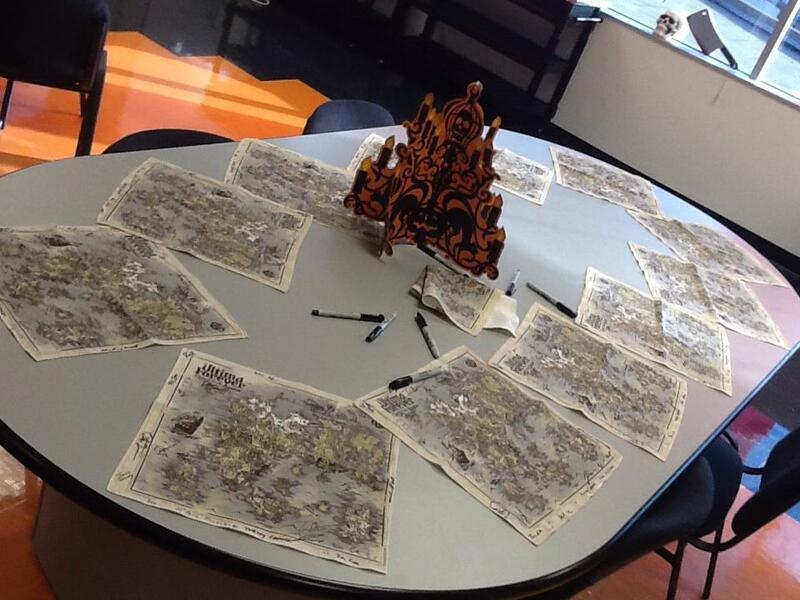 Some will band together to from a pirate clan, others a merchant guild. There have been two new RSI articles posted. The first is a chapter of an adventure story and the second is Chris Roberts' take on physics. You can check out a video on the game's physics here. I will admit that the ship doesn’t need to have wings or fans on the front, but the idea behind that is for possible atmospheric flight (this is not a promise of planetary action for the early build but allows for expansions in this direction), and as a RAM scoop. Plus it just looks / feels cool! In the days ahead, RSI plans to release stats/images for more ships and allow members at the RSI website to upgrade their contributions. 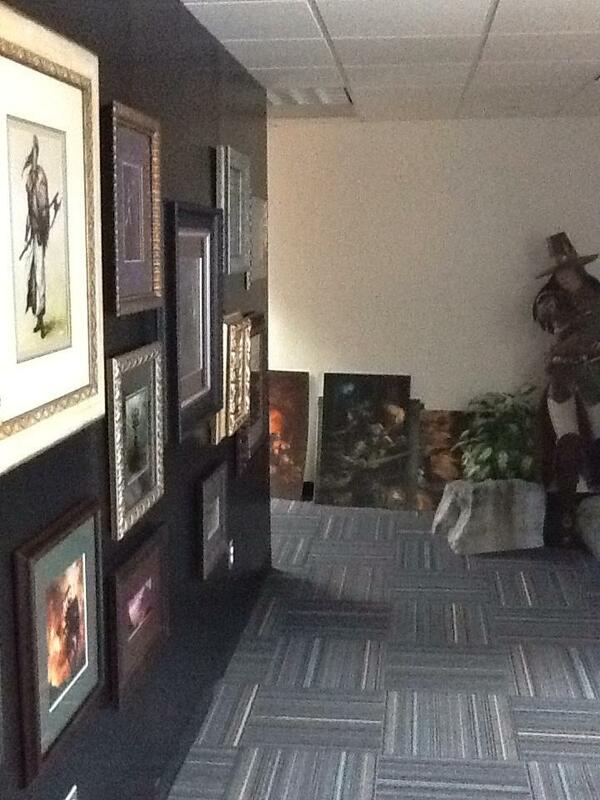 They are also shooting for a Reddit AMA with Chris Roberts on Monday. 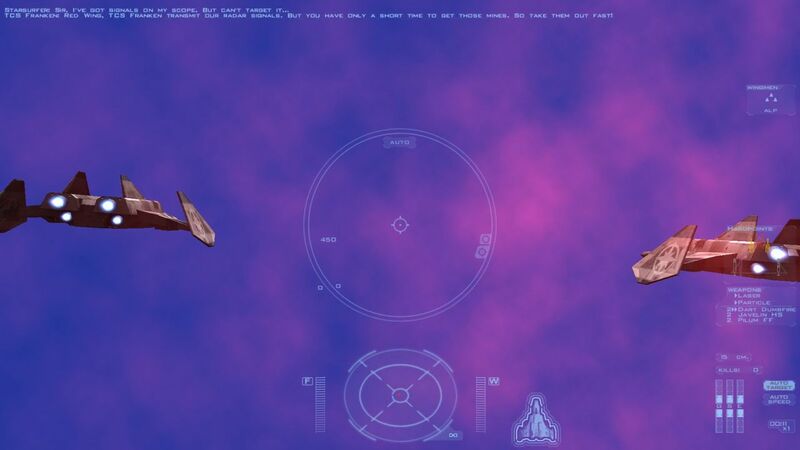 GOG's Macintosh Launch Includes Wing Commander! There's more great news for Wing Commander fans - Good Old Games now supports Macintosh OS X! 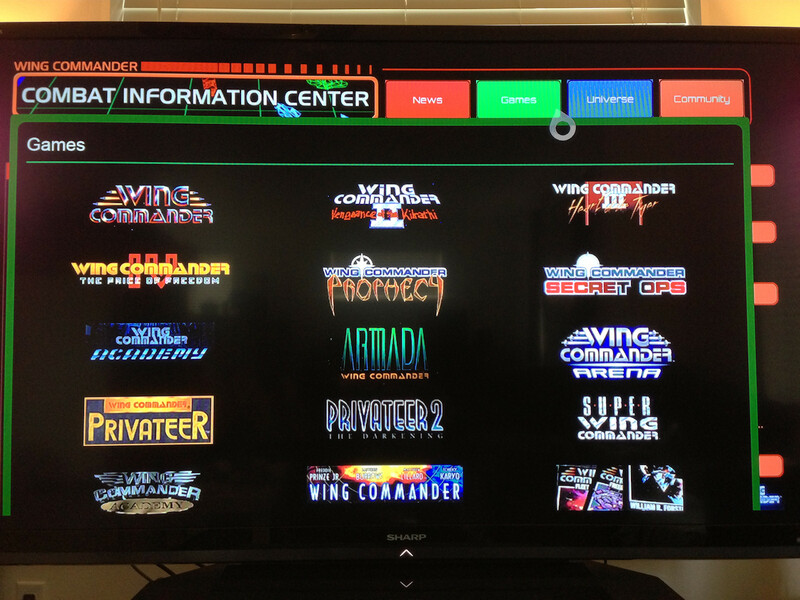 Fifty titles are part of the initial launch, including Wing Commander 1&2 and Privateer. Other Origin games on the list include Ultima 1, 2 & 3, Ultima 4, 5 & 6, Ultima Underworld 1&2, Savage Empire, Martian Dreams and Crusader: No Remorse, which is on sale for just $2.99. Wingnuts who've already purchased these games for Windows should automatically have the ability to redownload on Macs they may own - now get playing! We're bringing a part of our massive catalog of all-time classics to Mac, starting with an impressive 50 titles for Mac gamers to play and enjoy. 28 of the 50 titles, the best games in history, including Syndicate, Ultima series, or Wing Commander, will be playable on the Mac OS X for the first time ever--exclusively on GOG.com. The best games in history indeed! 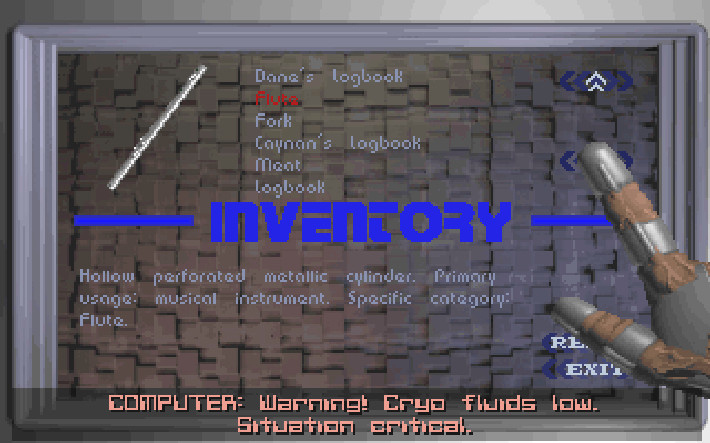 Amidst the Mac rollout, GOG also quietly released Origin's Bioforge! Although the game is highly praised by those who played it, the game was not nearly as popular as its WC or Ultima siblings, and it isn't particularly well known today. GOG has kindly included a handful of bonuses such as the game's manual, "field personnel file" and official strategy guide. Still not sure? You can find a vintage review of the game at Pix's website here. Ben Lesnick: Great news today: GOG.com has released Bioforge, one of Origin's under-appreciated gems. 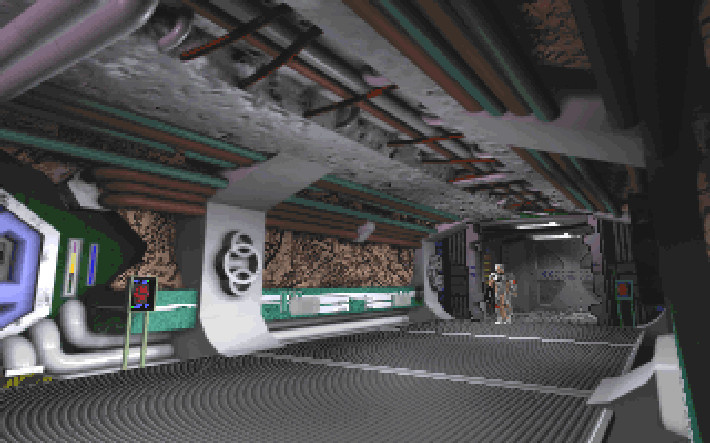 Although sold as an "interactive movie," Bioforge was actually the culmination of early 1990s adventure game development. 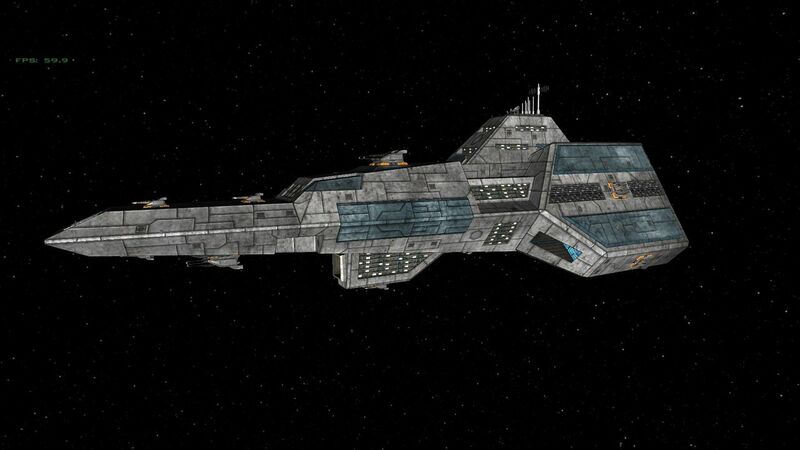 It's as lovingly crafted as any Wing Commander or Ultima, another rich world created by Origin. Also, it has the shuttle from Super Wing Commander in it. And you can choose to beat a blue guy to death with his own arm. The game also had a brief cameo starring the shuttle from Super Wing Commander! Check it out in the shots below (the third picture is from Bioforge), or watch ths SWC intro. 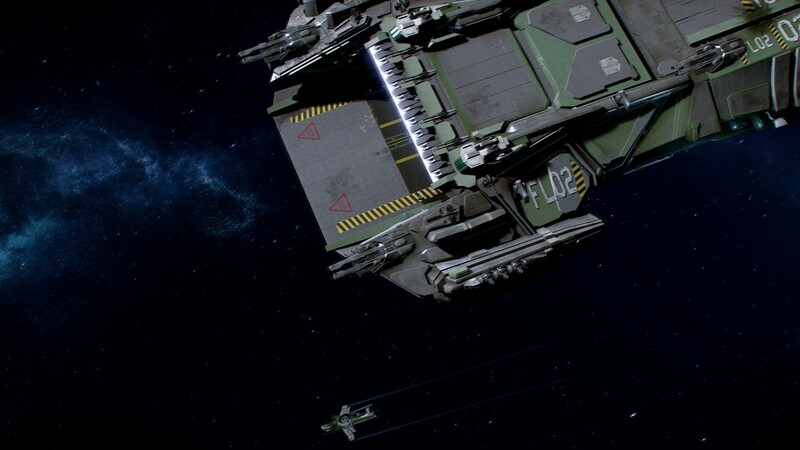 In a touching moment, the recent Star Citizen reveal began with a tribute to the late Paul Steed in the form of a Bengal class carrier that bears his name! In some ways it was quite fitting that Chris Roberts chose to reveal his latest labor of love at the GDC Online conference as Paul himself was for a long time a GDC Advisory Board member. 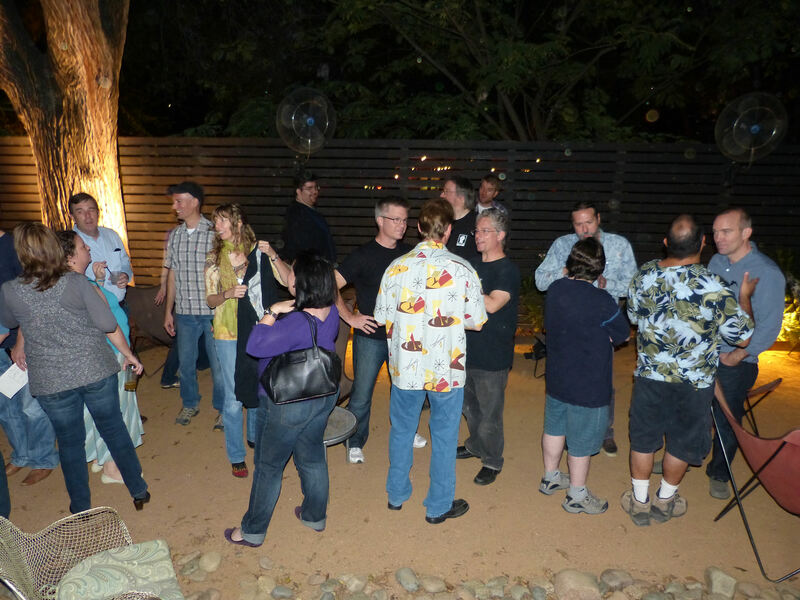 The Games Developers Conference has set up a memorial fund to support Paul's family in their time of need. "We like to tell ourselves that we're a young industry, but we're not so young anymore. This summer we've been confronted by our own mortality with the sudden death of Paul Steed, a pioneer of real-time 3D graphics who was an icon of the brash early days of the game business. He died on August 11th at the age of 48 and is survived by his wife and children. Unlike most of us, Steed didn't labor in obscurity. If you were involved in games during the '90s – whether as a professional or as a fan – it was hard not to pay attention to Paul Steed. 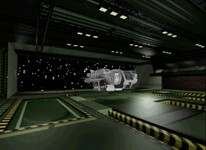 He worked on some of the seminal titles of the decade, notably the Wing Commander series and the Quake series. He produced the first demo for Xbox 360, presented a Game Career Seminar Keynote at the Game Developers Conference, and was a leading exponent of art outsourcing – proving that he could remain topical for nearly two decades. Always outspoken and always controversial, he was not a typical game artist – but he was the most public exemplar of what we do for people both inside and outside the business." It's been a big day for Roberts Space Industries! In addition to the video below, Chris Roberts has penned a lengthy letter that covers current status on his project. 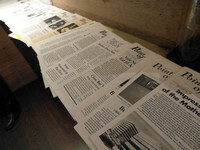 His website has also kicked off a new set of features called "Spectrum Dispatches." The first one is a transcript of a rowdy newscast. 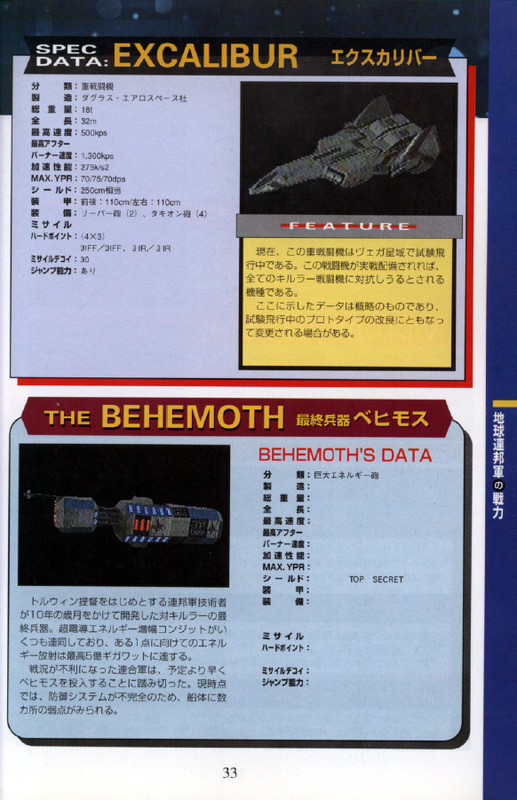 Finally, there's word that more ship info will be released soon. The pledge drive has also had an amazing day! The last 24 hours have brought in $200,000, including more than $90,000 and 2000 new backers on Kickstarter. For those unsure of where to contribute, both tallies will eventually sync up and contribute to the same pool, so KS supporters are working towards the $2 million minimum and stretch goals. 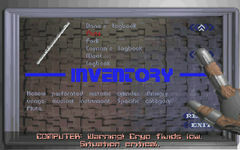 Eventually, the main RSI interface will allow upgrades, although this feature is already available at Kickstarter. KS will not bill you until the end of the campaign, although Paypal also includes a "BillMeLater" option. KS also deducts a 5% fee for their services, but is very user friendly. Not all countries are supported however, so many Europeans or people who prefer Paypal should use the main RSI site. 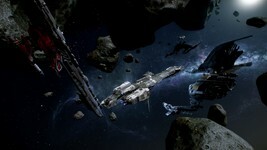 Breaking: RSI Pledges Now On Kickstarter! 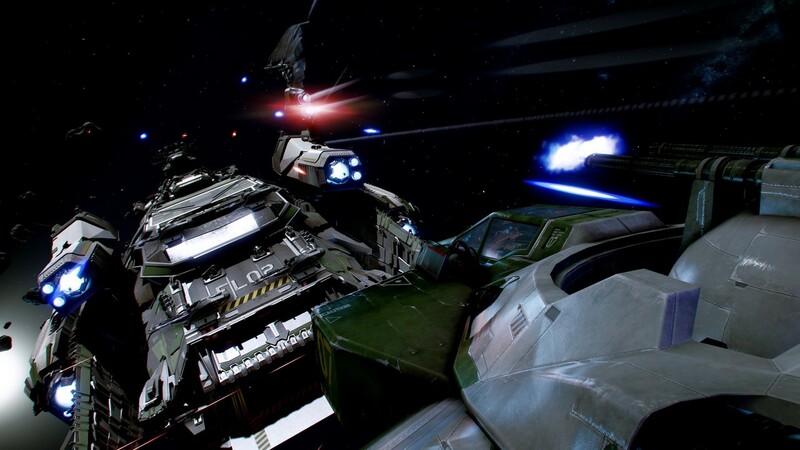 We didn't have to wait long for the big news that Chris Roberts promised earlier today - you can now back Star Citizen using Kickstarter! To complement the announcement, Mr. Roberts has also produced a video to appeal to anyone still unsure about pledging. It is well worth watching, if only to see Mr. Roberts' choice of reading material. There's also been a slight tweak to the names of the $5,000 and $10,000 tiers. The first was renamed from Lt. Commander to "Space Marshall," and the higher level went from Commander to "Wing Commander." Awesome! If you have already made a pledge but would like to show your support on Kickstarter too, you can buy in to a new $5 pledge which comes with a bonus ship upgrade. For fun, we’ve created a small Kickstarter pledge for existing backers. It’s called the “Kickstarter” and it’s an Electro Skin Hull Enhancement module. 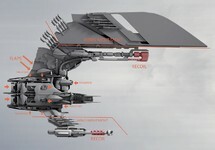 This is an upgrade package that players will be able to buy in game that allows ship owners to switch their hull appearance at a flick of a switch. The idea is that we will make skins available and allow players to make their own (within rules) once the game fully goes live. 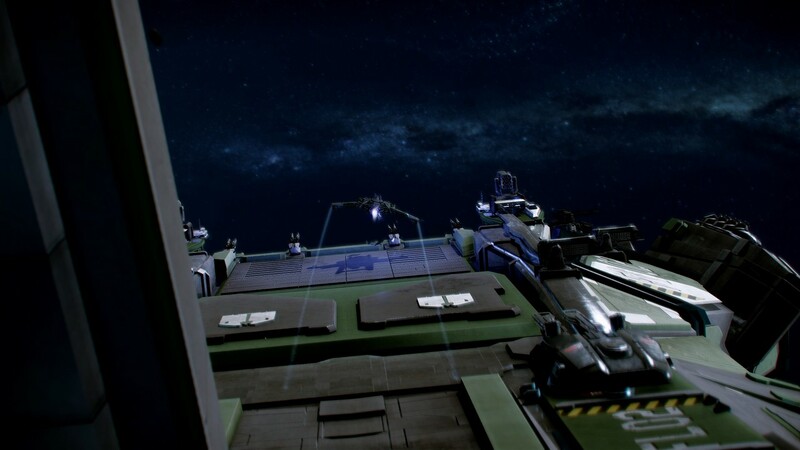 So for the $5 “Kickstarter” pledge we will add it to your current ship package, along with a custom skin that will tell the world that you backed twice! We added it to Kickstarter to allow fans to show their support in both places without breaking the bank. If you'd like to add a bit extra to your package, just make your way here! Breaking: RSI Achieves First Million Dollar Milestone! We hit $1M at 9:35 am PST!!!!! And this was without adding in the lagging backup site orders! Thanks to everyone that helped push it in the last 10 hours! 50% of the way to the minimum goal in just over 7 days!!! And there will be some additional big news in a few hours. ...You guys are all legendary! Pix has posted a fun treat. 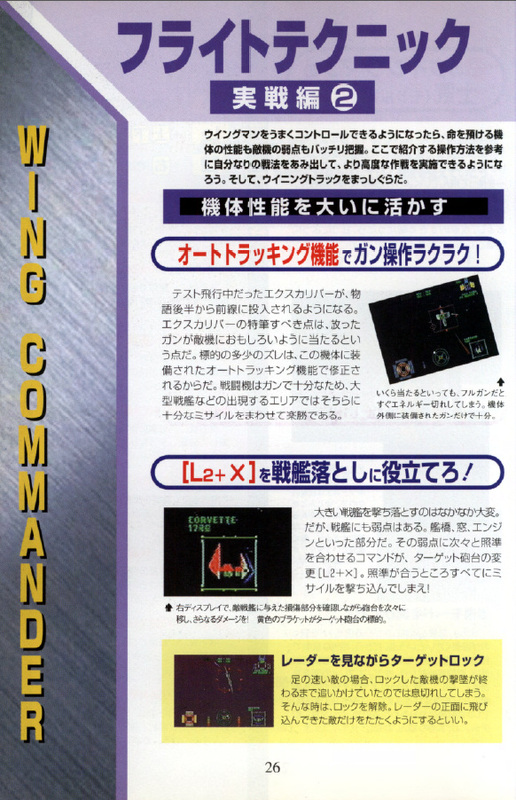 He's recently digitized the Japanese Official Guide to Wing Commander 3 for Playstation! It's a fabulous 132-page book full of color photographs and diagrams that cover everything from background information to ship stats to mission details. 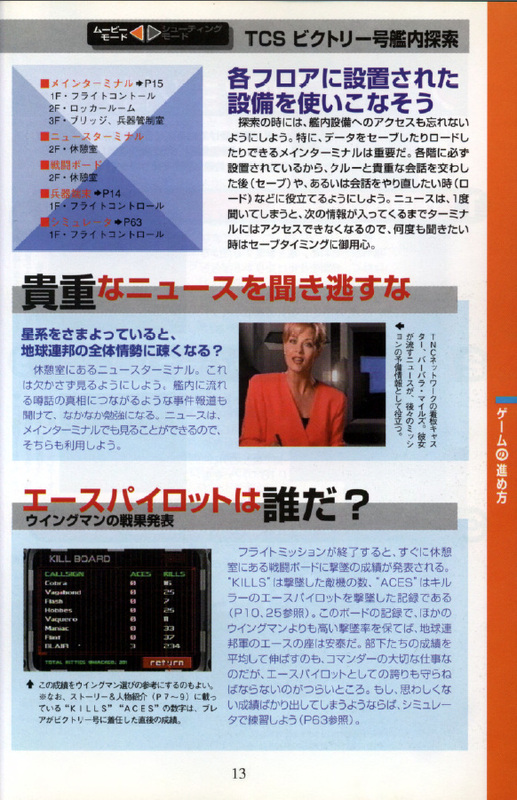 Of course, the text is not in English, so Japanese speakers are more than welcome to translate any interesting finds! Check it out at Pix's Origin Adventures website here. Roberts Space Industries has a few miscellaneous updates today. They report that a "fan site kit" is under development, but in the mean time, several high res game logos have been put together. They also now have an official YouTube channel for easier viewing and embedding of videos. Finally, there's a new poll that asks about people's actions/intentions regarding the pledge drive. The funding campaign is now up past $940,000 - closing in on a million dollars! 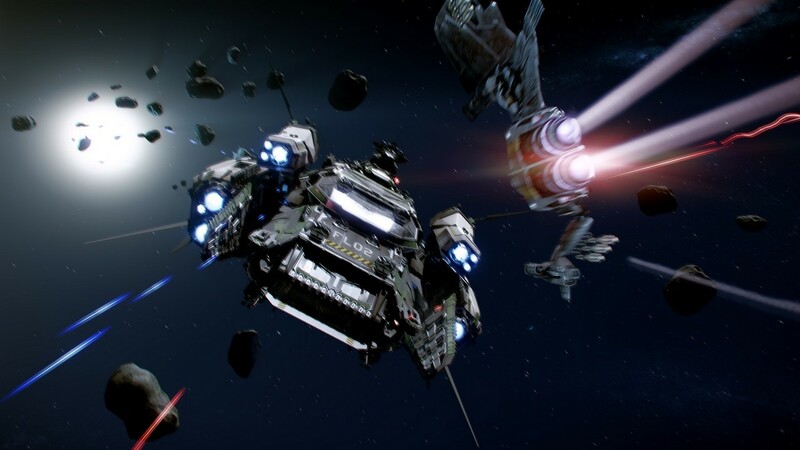 Have you pledged to support Star Citizen? Yes, but I want to pledge more! Chris Roberts has also just posted on Facebook that he's challenging followers to help the campaign break a million dollars by 10 am Pacific time Thursday. There's even a bonus for hitting this goal! Since the system does not yet allow users to upgrade their pledges, it's up to those who have not yet signed up to support the new game to help achieve this. I would like to hit $1 million by 10 am PST Thursday. So we need to raise $58,112 in the next 11 1/2 hours! If make this target we'll add 500 in game credits to all current backers ship packages as a little gift back to all the early supporters! It could mean the difference between the basic targeting system and the multi-target tracking one! 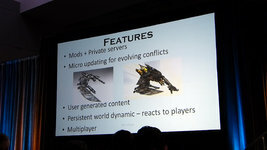 Kevin Caccamo reports that he's nearly ready to start some limited playtesting of the WC Hostile Frontier mod. 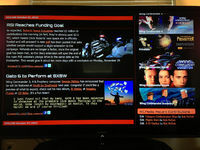 If you're up to providing feedback for this project, let Kevin know at the CIC Forums. I've been doing some more work on WCHF lately. First of all, the development version of the mod is now compatible with WCSaga final, and thanks to someone on the HLP forum, we got WC Saga running on standard FSO builds. 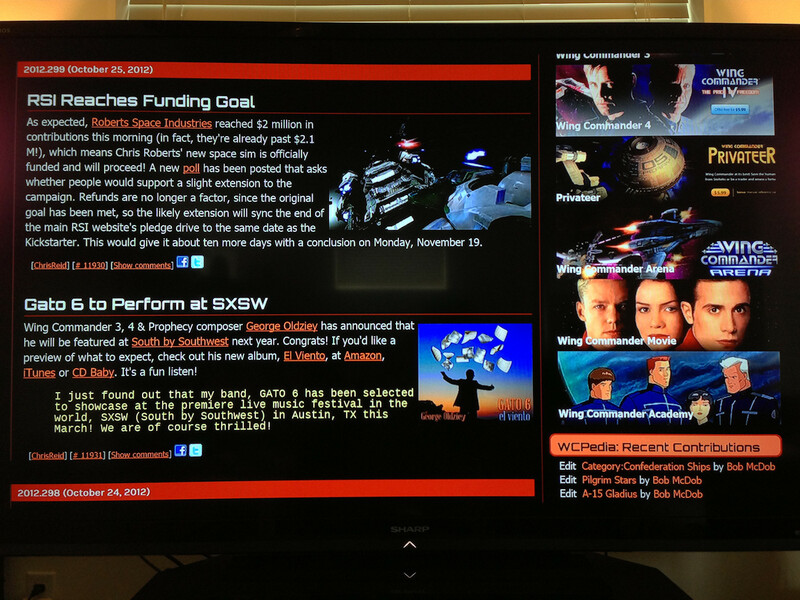 I'll be starting a short beta test soon. Avacar reports that development continues on Wing Commander TacOps Online. Most of the play mechanics are nearly complete, so the project's schedule has been adjusted in order to get a suite of tools in place that will help game masters run their own campaigns. 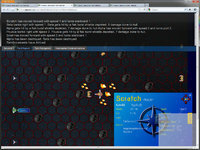 WCTOO is an electronic version of a popular fan made tabletop WC game. Curious Wingnuts can see the latest digital build here. 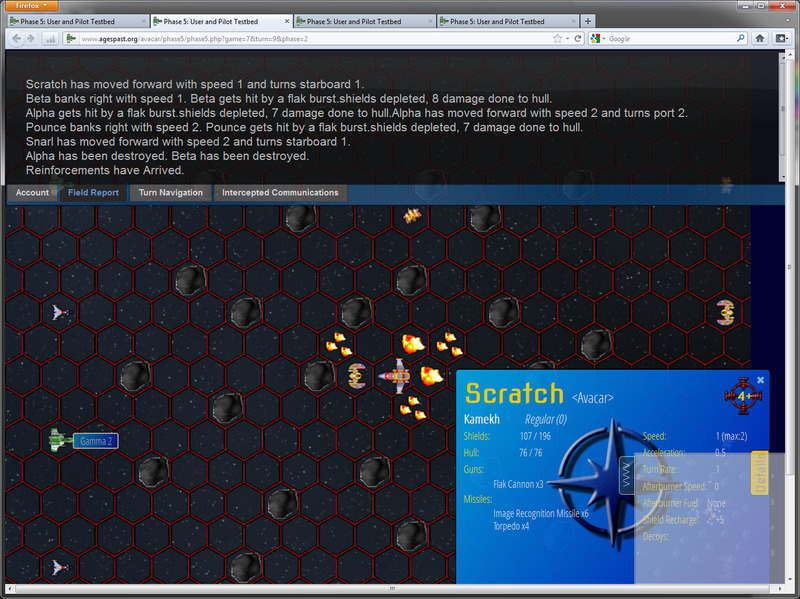 Create a new overlay which allows "game managers" to edit ship stats on the fly, add new ships, delete ships, etc. Update the "game" database to include more information about who runs a game, who has permission like a manager for a game, etc. Update the user table to enable reverse game lookups, i.e. have games you're members of listed for you. 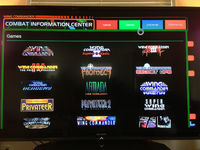 Rebuild the front area to no longer be like the old WCTO page, but instead better reflect the fact that this is a dynamic site with updating games. 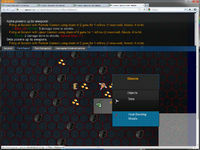 Add features like "your games" "watch games" "create games" etc. Call for suggestions on the UI from users (all those ideas i've told you to hold on "until the future") and try to implement them. Roberts Space Industries has published a supplemental Draft FAQ that seeks to answer emerging questions that have popped up over the last week. It goes beyond the original FAQ posted on the bottom of the Star Citizen page with additional juicy tidbits. A couple key explanations are below - check out the full document for more! The pledge drive is now over $875,000 and is closing in on 10,000 individual contributors. Highly skilled artists like Tim Peel are often obsessed with detail, and when an odd shadow was noted in his last wallpaper, it needed to be fixed! The updated image below now shows the main engine nozzles fully illuminated. Grab it in either 1920x1080 or 2560x1440. For good measure, the view from the front has been included here as well, since such a gorgeous design deserves to be seen again! This model was originally created by the talented Howard Day. 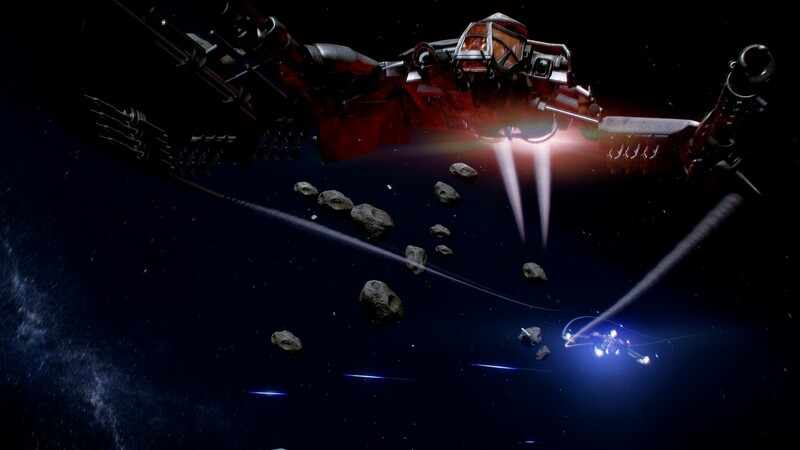 Roberts Space Industries has posted two different articles that highlight the enemy fighter that's been featured so far in the new game. These shots specifically call out the big engines and numerous directional thrusters that drive the game's physics - what a day for engine lovers! 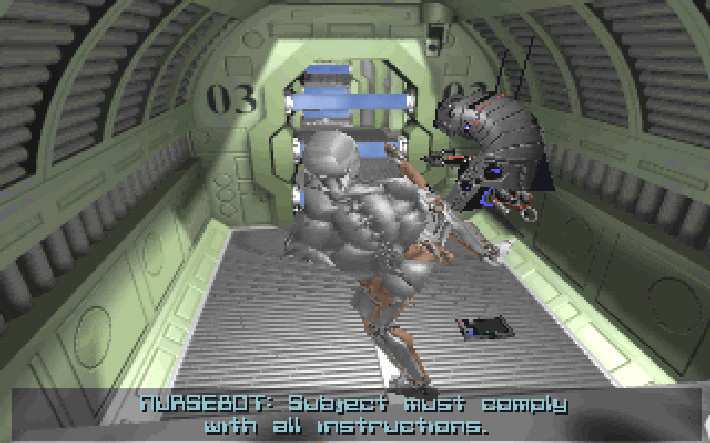 The pictures also do a good job of showing off the alien race's Kilrathi-esque aesthetics. 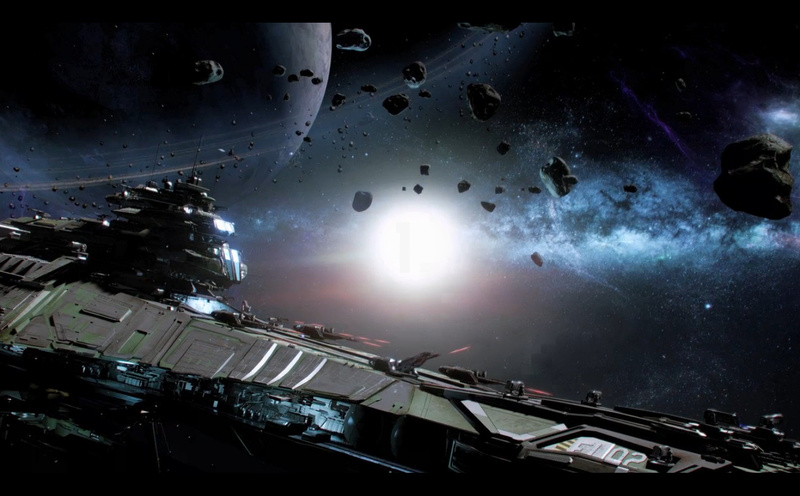 As far as the pledge drive goes, Star Citizen has now raised more than $800,000! Roberts Space Industries has announced that the core of their website has been restored, including the tally of how their funding campaign is going. So far, more than 6800 people have donated around $660,000, which means the project is already about a third of the way to its first goal. 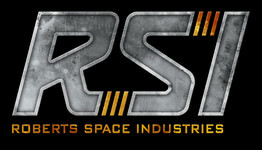 However, it can be hard for such projects to maintain their momentum after initial announcement, so RSI promises to keep a steady flow of information coming that will include more fan-polling, fiction features, Wing Commander history and Chris Roberts Q&A. If you're not seeing the new RSI site after a shift-reload, try clearing your browser cache and returning. And if you haven't watched it yet, check out the 11 minute pitch video of Chris Roberts detailing his goals and aspirations for the new game. What a long, strange trip it has been! I'm very pleased to announce that the Roberts Space Industries website is coming back online as originally intended. Thanks to the heroic efforts of our web team, you can now pledge as originally intended as well as access your account information and view the real time pledge counter. More changes are coming, too: we're in the process of setting up the more robust forum you deserve; a search feature, PMs and everything else you have asked for will be available soon. Additional payment options and the ability to add to your existing pledges (against all odds, you demanded it!) will be online in the coming days. It's not all going to be apologetic letters and 'back to normal' updates, either. Now that we're not "all hands on deck" dealing with the site outage you will see the Comm-Link and other familiar sections return to life. 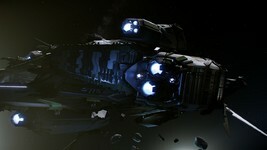 Expect more polls, in-depth ship descriptions, news from the world of Star Citizen and more Q&A with Chris Roberts! Ask him about physics! (On second thought, maybe you shouldn't, we'll be here all day…) We're also putting the finishing touches on the maps and the Galactapedia. And one last thing: your Golden Tickets WILL RETURN. We had to put them away while we fixed the site, but you'll find them waiting for you in your accounts in the coming days. I'd like to thank you all, personally: you space pilots have proven yourselves to be the most thoughtful, helpful and incredibly patient group I have ever had the pleasure of working with. 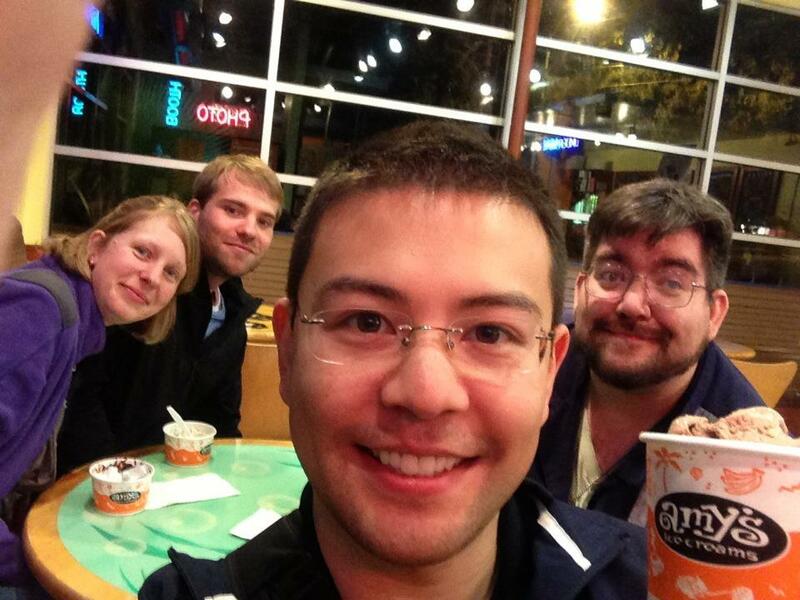 I feel terrible that the web issues have impacted such a great group. We're going to do everything we can to justify your treatment of our endeavor. It's going to be cool! The WSJ Speakeasy has interviewed Matthew Lillard on his part in baseball drama Trouble with the Curve. Lillard is noted for playing Shaggy in the Scooy-Doo reboot and recently made headlines with his directorial debut, but he is perhaps best known for portraying Maniac in the 1999 Wing Commander feature film. You play the antithesis of Clint Eastwood in this film, the new technology statistics guy. What did you know about baseball and statistics going into this movie. I knew nothing. Math in general scares me in a really primal way. I know nothing about math and I’m pretty sure my 5th grader can do more math than I can. How did you deal with ERAs and RBIs and everything you character talks about in the film? The same way I dealt with "Scooby-Doo." It’s just not real. So I never have to actually manipulate any facts but maybe that’s just because I am not Daniel-Day Lewis enough. Did you see him, he looks so good? 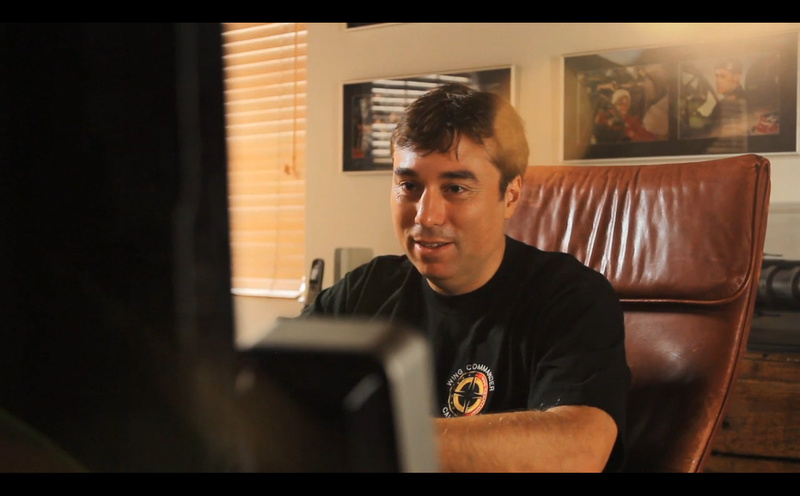 Chris Roberts has posted a new letter to the community to give them an update on his new game. The message describes how the response has been overwhelmingly positive, and this led to some considerable downtime on the first day of the game's crowd funding campaign. Despite the outages, donations in the first day-and-a-half amounted to nearly half a million dollars, a quarter of the minimum goal! Although it surely would have been higher had everything been working smoothly all along, multiple news outlets have posted about how impressive this take is. The average donation per contributor appears to be trending higher than for typical Kickstarter games, and there's still four weeks to go! Roberts Space Industries will soon begin posting more feature articles that answer some of the frequently asked questions, so stay tuned for incoming intel. If you’re one of the lucky few warriors that snuck past the Java trolls and WordPress goblins to access the pledge site yesterday, thank you so much for your dedication. 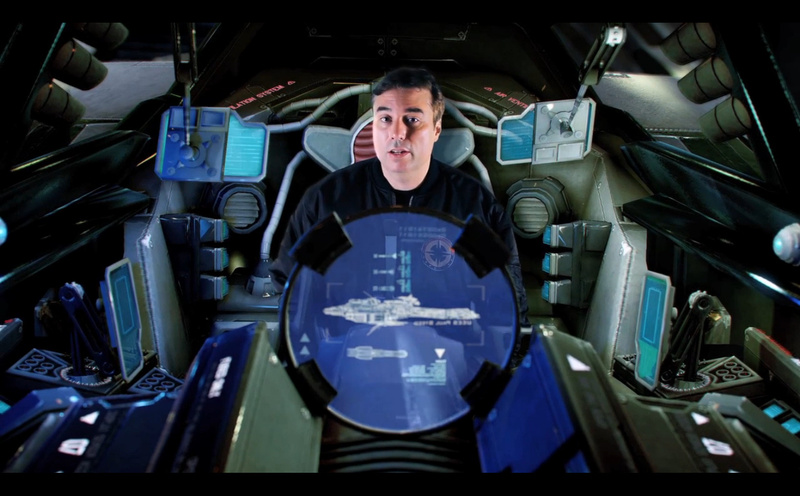 Wingnuts have been going over the new Squadron 42 movie with a fine toothed comb, and they've found some interesting Wing Commander references! 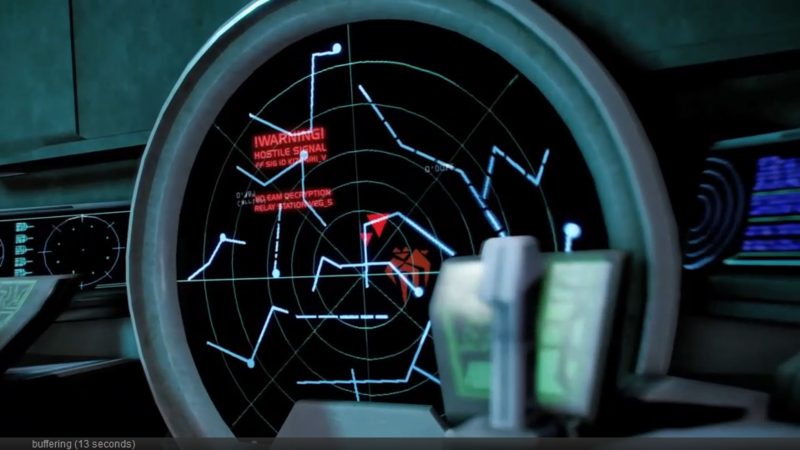 Among the first items that fans spotted was a Kilrathi radar screen symbol, but even more are highlighted below. 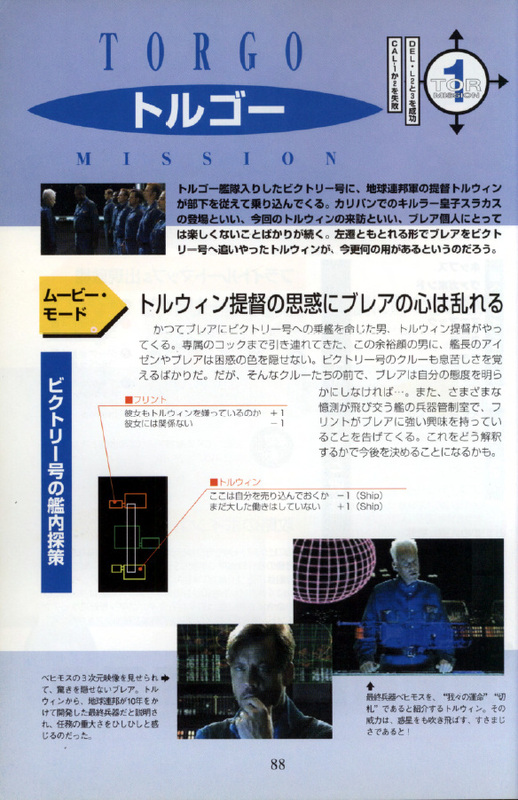 The video starts with a text overlay that establishes the setting as the Kurasawa System, home of WC1's grueling Ralari Defense mission. 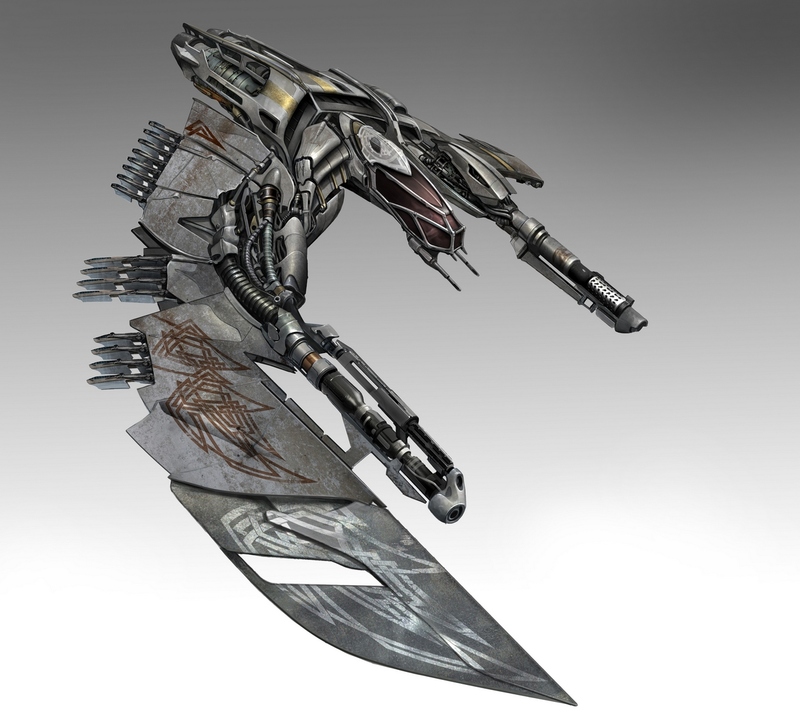 The carrier we see is the same class as the Tiger's Claw, and its name is in honor of the famous Origin artist. Takeoff down the Paul Steed's flight deck also mirrors launch down the Claw's tubes. 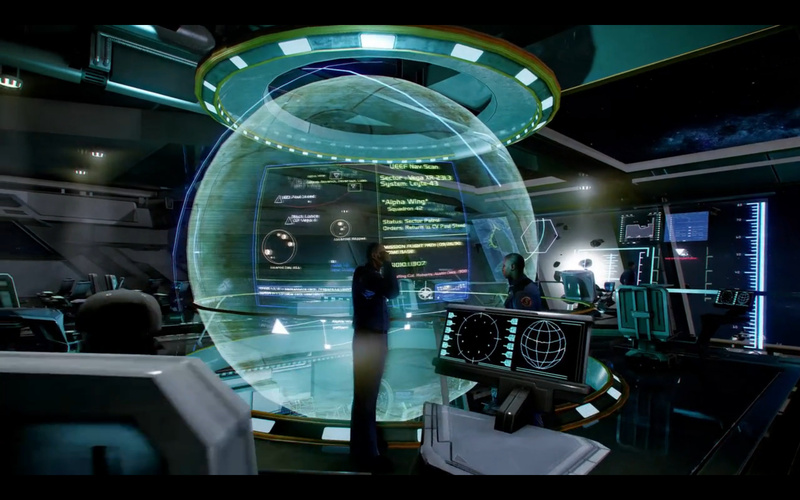 The bridge is full of nifty Easter eggs! 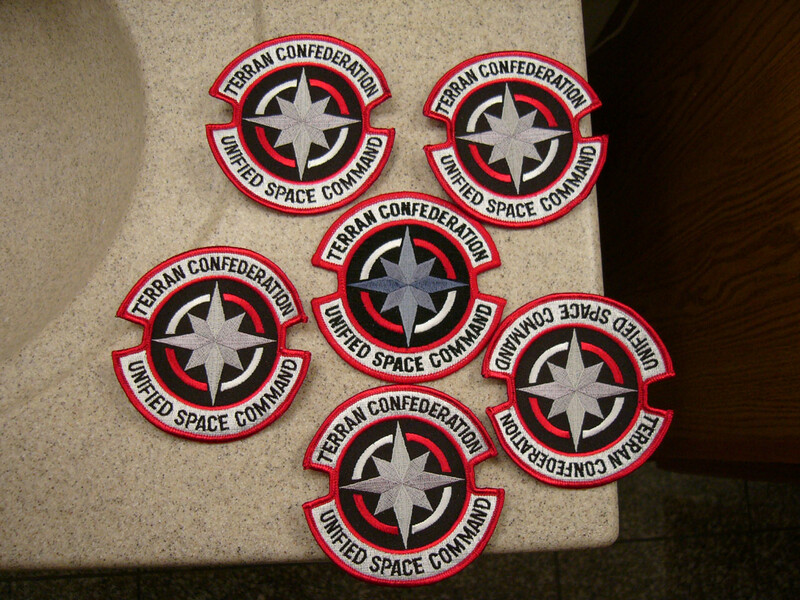 For starters, the crew's uniforms are straight out of WC4, down to the "Terran Confederation - Unified Space Command" shoulder patches. The display globe includes fun references such as a Confed star logo, pilots Maverick & Deveraux in Alpha Wing, an item denoted as "Black Lance," mention of WC1's 09/26/90 ship date and a debriefing with Colonel Roberts. 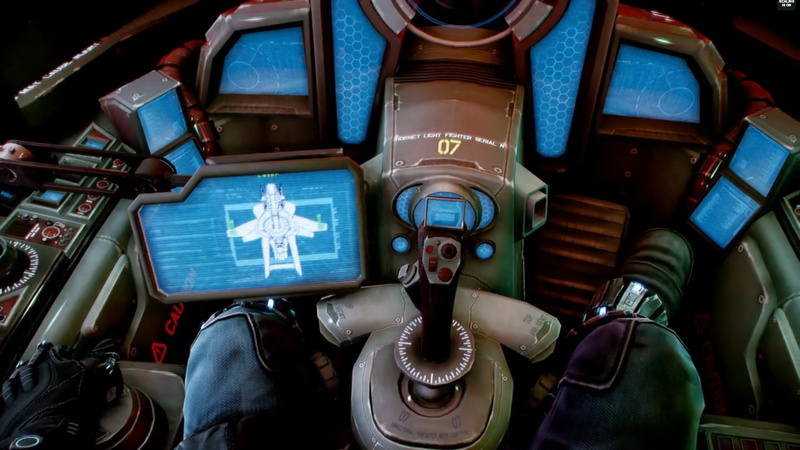 In the cockpit, the game's iconic Terran ship is described as the Hornet Light Fighter on the center console. Upon exit, the forward fuselage is very similarly shaped to the Hornet from WC1, and its canopy articulates in a similar way. Last, but not least, the Squadron 42 logo is a flipped tribute to the classic WC logo! Thanks to Zeether for snapping some of these shots! What else have you found!? Check out what other similarities people have found at the CIC Forums and please share your own discoveries! Breaking: New Chris Roberts Game Announced! Roberts Space Industries has announced their new space combat sim! The new game is a complex, ambitious and exciting adventure. The overall framework is titled "Star Citizen," which Chris Roberts described on two levels: The first aspect involves the player character's citizenship in the universe, which could be determined by either military service like traditional Wing Commander gameplay or successful business a la Privateer. Alternately, the concept also involves bringing fans into the fold and making them citizens of the universe by involving them in the game's development. The single player campaign will be playable both offline or online in cooperative mode with your friends, and there will also be a dynamic multiplayer universe for all the merchants, mercenaries or pirates out there. The game's storyline campaign has been dubbed "Squadron 42," and it describes the player's role as a member of this elite wing. 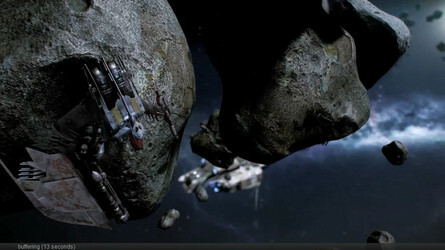 A lengthy trailer has been released that shows the Bengal Class Carrier, UEES Paul Steed, come under attack in the Kurasawa System of the Vega Sector. 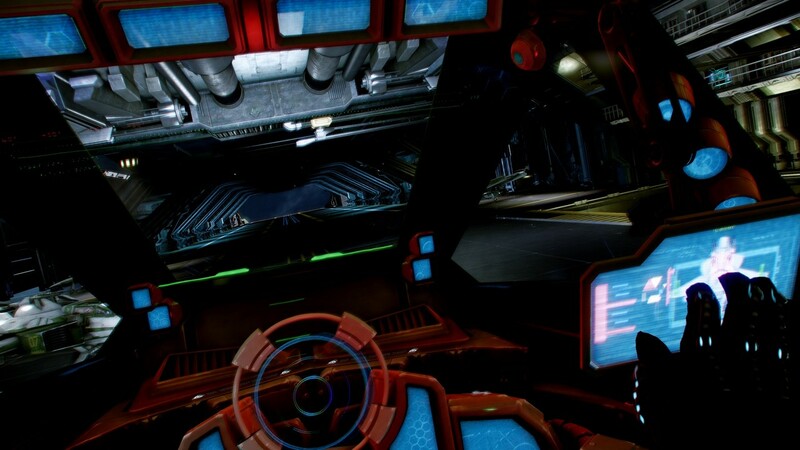 Many classic Wing Commander touches were in full effect - from the dash down the red-tinted corridor to being able to see your hand on the joystick in the cockpit. Players will be able to walk around their carrier and even right into their fighter. Each ship has dozens of moving parts, and the spaceflight/carrier-based portions are rendered seamlessly in the same engine. Check out these gorgeous screenshots below! Under News, you'll find links to older archives, social media links and the latest poll. 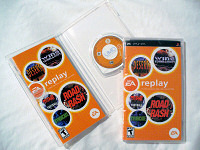 The Games section links to product background pages where you can find information, downloadable game documentation, patches and more on that particular title. 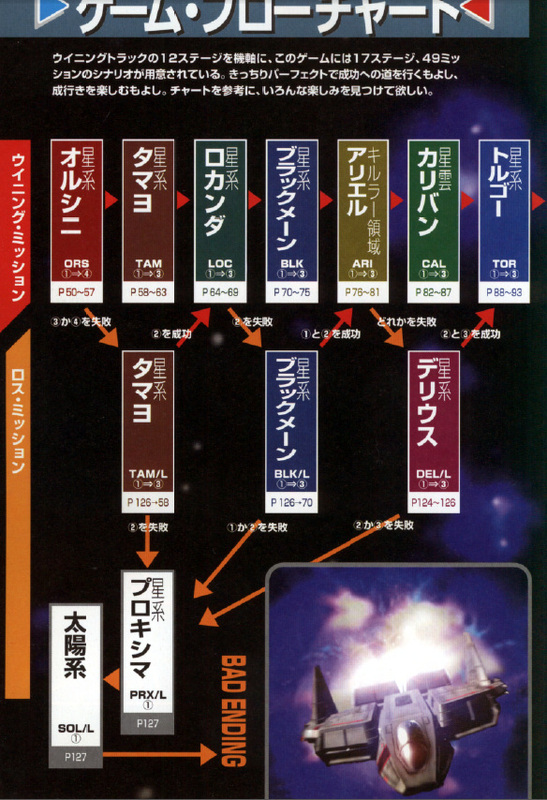 Information on characters, ships and places can be found under Universe. Forums, #Wingnut and InfoBurst are a few of the sections you'll find under Community. 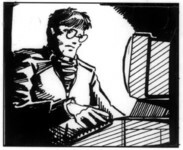 Almost the whole staff pitched in with ideas or sketches, but most of the credit goes to ace, who was the only one with working knowledge of 21st century web technology. You may notice a missing section or a broken link somewhere. We'll probably get to it soon as we continue to tweak the layout, but you are welcome to point out bugs or oddities by commenting on this post, or by posting to the site feedback forum. If the site looks broken in IE9, you may want to check your compatibility settings. You can do this by disabling Compatibility mode entirely or by pressing Alt (to reveal Internet Explorer's main menu) and going to Tools > Compatibility View Settings and removing wcnews.com if it happens to be listed there. In order to finance the new game, Chris Roberts has arranged a variety of private investors, but he is also looking out to fans to support the new game's development. The funding campaign is being run like a typical Kickstarter program, although everything is managed directly through Roberts Space Industries. There are numerous tiers that range from $10 to $10,000 contributions, and each provides an associated benefit. For example, the $125 Wingnut tier gets players the Hornet fighter, access to the alpha/beta builds, in-game credits, a ship-shaped USB stick, the game's CD soundtrack, glossy color map, hard bound manual and more! The initial crowdfunding goal is $2 million, but there are top tiers with additional benefits if the community reaches $3, $4 or $5 million. There's even a tantalizing secret $6 million level! Note that the site is currently being hammered by the initial excitement. Backup sites have been set up for North America and Europe in case the main RSI website is unavailable. Good morning! Chris Roberts is set to announce his new space sim title at the GDC in Austin in a few short hours, but the action starts early with Gametrailers.com apparently leaking the trailer! The game appears to be (tentatively?) 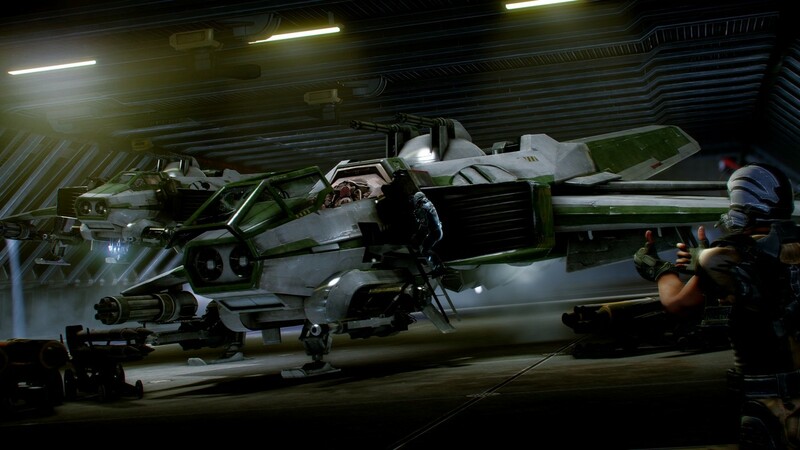 titled Star Citizen - Squadron 42 and does not yet provide any explicit clues as to which franchise it belongs to, or if this is an entirely new series. We'll have to analyze it frame-by-frame, but for now we present the following screenshots without further comment. Get ready to jump on the cockpit of Squadron 42 and discover that, even in the furthest reaches of space, there still exists a PC game proud to be a PC game. Thanks to everyone who wrote in to report this! 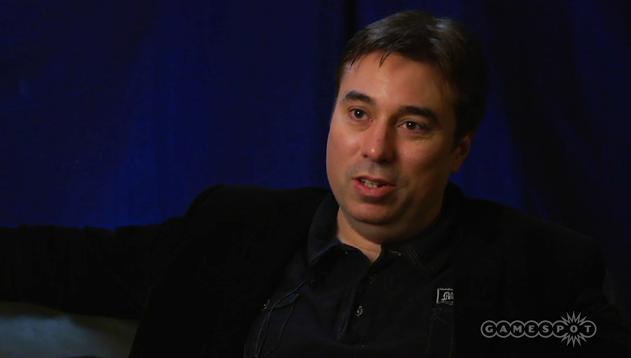 One day before the big event, Gamespot has posted a video interview with Chris Roberts. In the clip, Roberts talks about what drove him to create Wing Commander and what he'd like to accomplish with RSI now that technology has caught up with some of his ideas on the video game experience. Check it out here! As anticipation of tomorrow's unveiling grows, the RSI site has posted the latest fiction teaser - a fifth grader's book report about the life of famed fighter pilot. Today's other entry is a commlink article that reminds us about where to follow tomorrow's event. 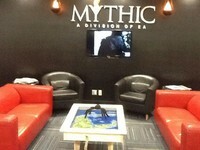 The event will be streamed from GameSpot here at 10 AM Eastern time, and we'll also have updates here throughout the day! Come chat with us in #Wingnut to discuss the announcement! The big day is almost here! In just 24 hours the world will know what Chris Roberts has been working on... and you select fans were the first on the scene. 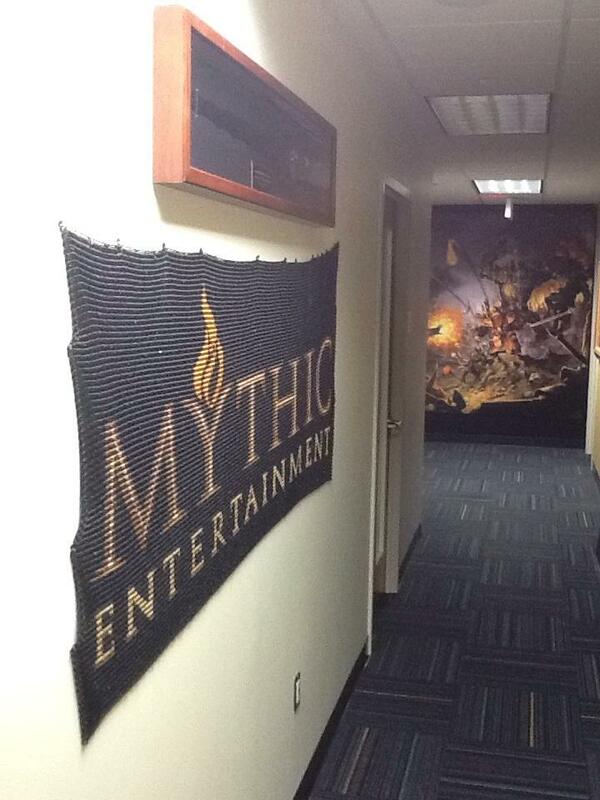 As game development progresses, your dedication will NOT be forgotten! 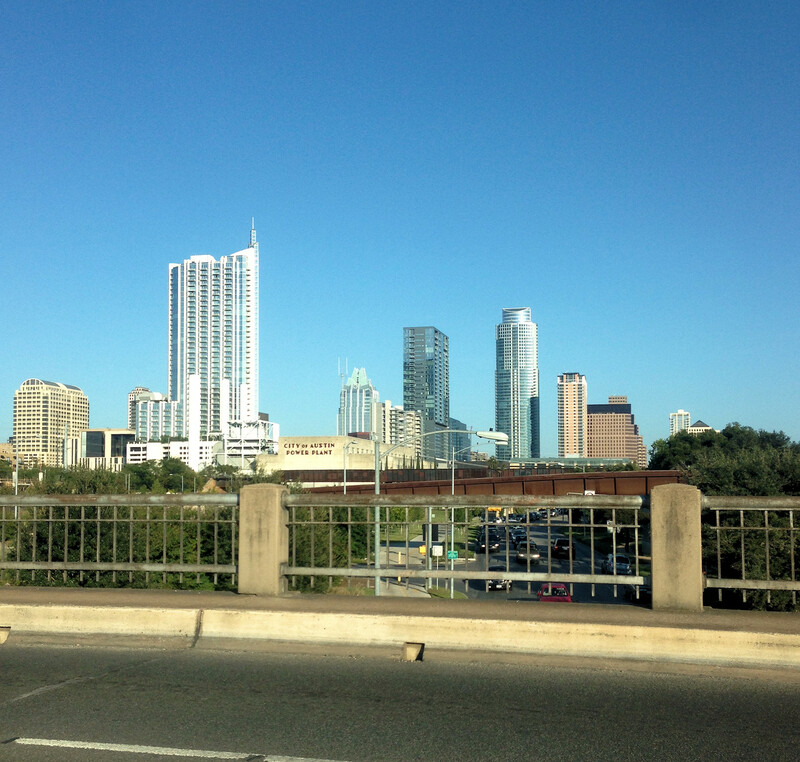 Today was another fun day in Austin! 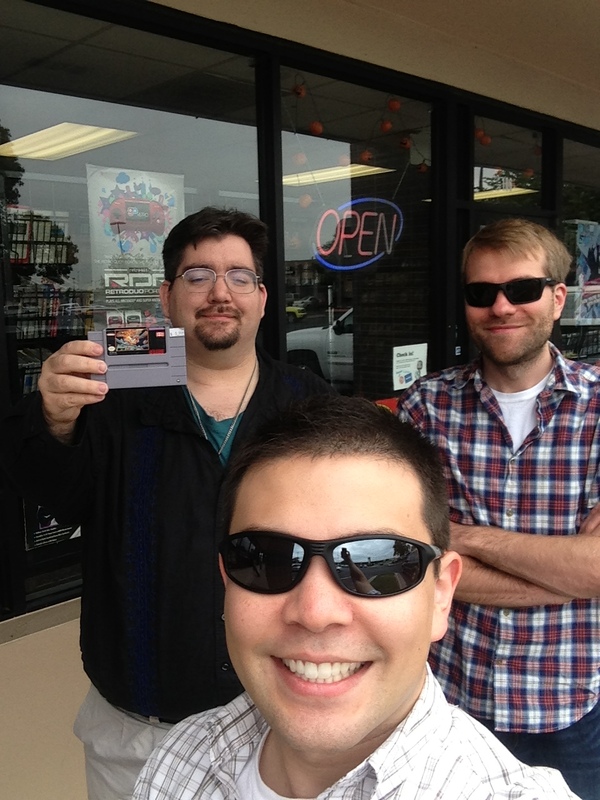 We spotted a Super Nintendo WC1 at a used game store and were also able to spend some time catching up with a bunch of awesome Wing Commander veterans. 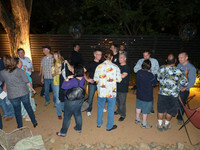 You can find pictures from the Origin Reunion that was held this evening at the CIC's Facebook Page here. 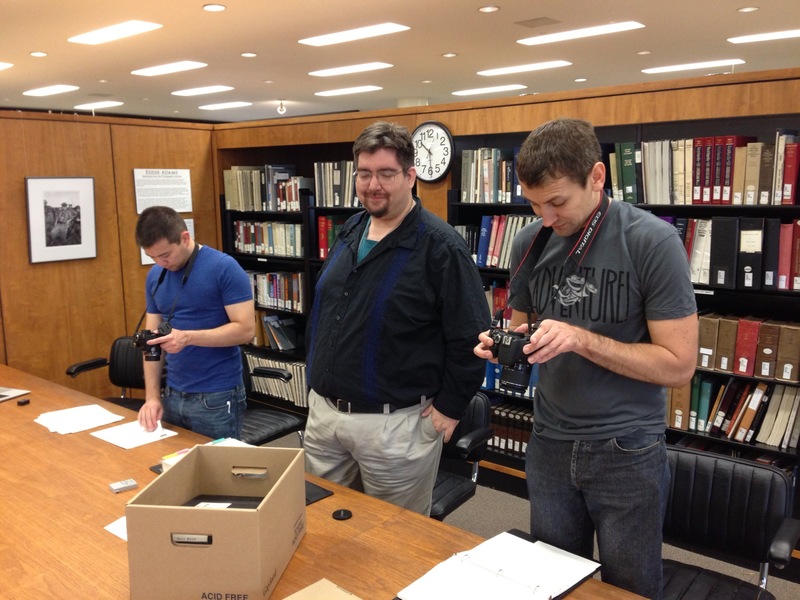 Today the team revisited the Origin archives at the University of Texas and digitized almost 6000 pages of new Wing Commander-related material. It'll take some time to go through all the scans and see what was included, but there's a fun shot of a WC3 storyboard below. 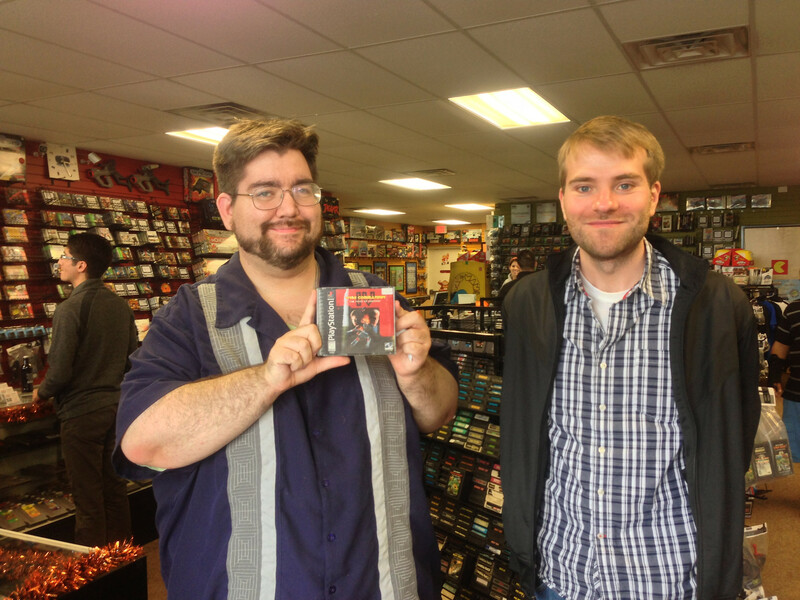 We also continued our streak of finding used Wing Commander products in the local game/book stores by scoring a 3DO Super Wing Commander. 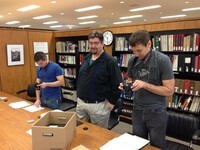 Also, a big shout out to Pix for putting in some long hours at the library with us! 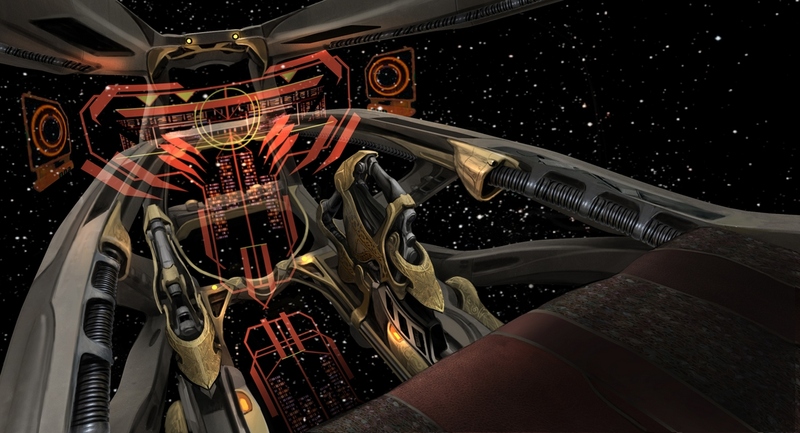 RSI updates for today include another fiction teaser and a posting of the original June 2, 1990 press release that announced the first Wing Commander game. 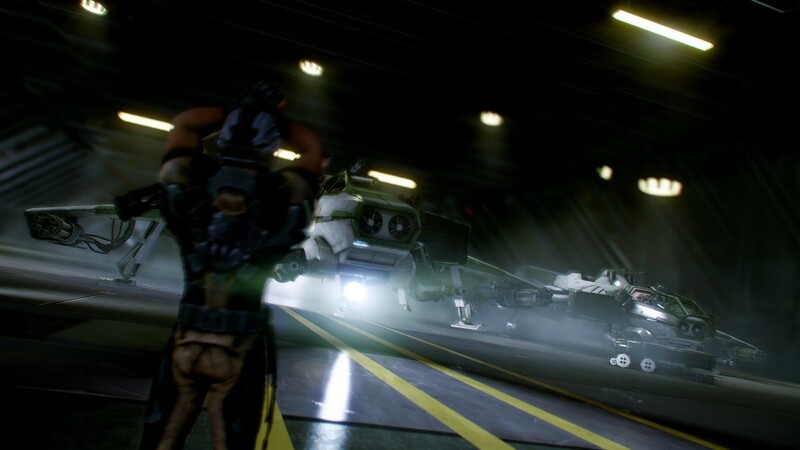 There's also a new concept image of the carrier that originaly showed up on the enlist page, but now it's in higher resolution! 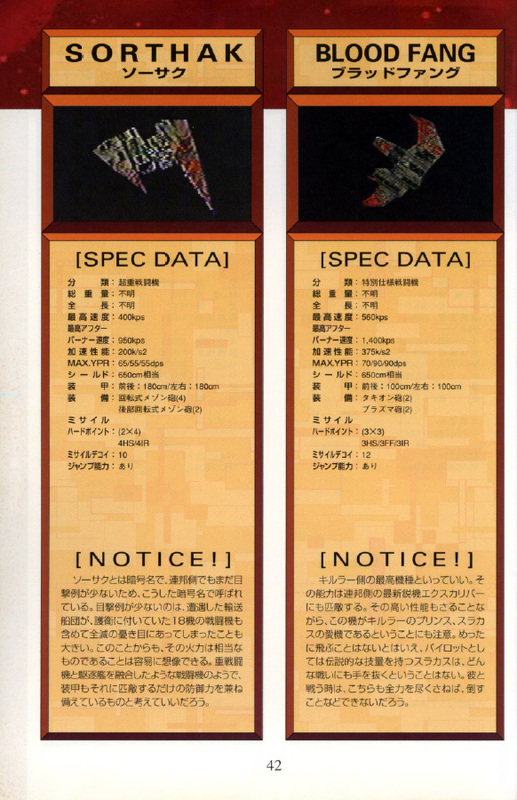 Looks closely for small green text that describes what various areas of the ship are for. 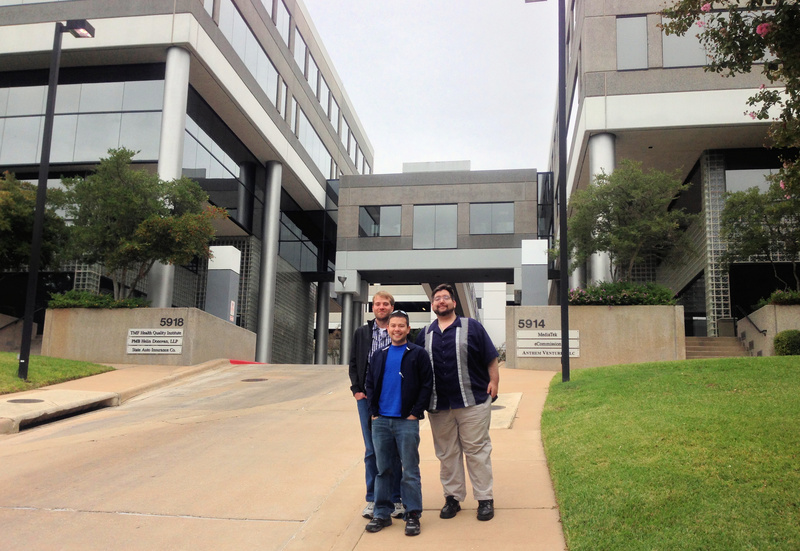 Adventures are just getting started on the ground in Austin! 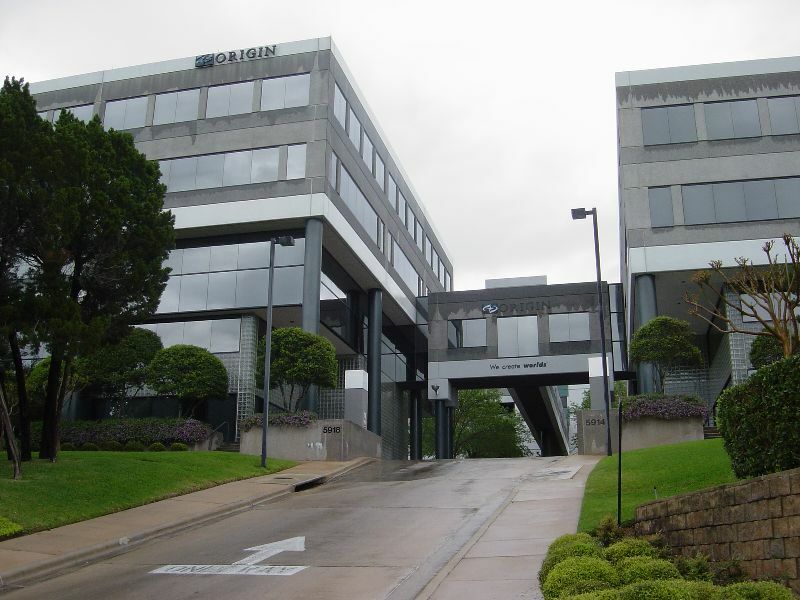 This morning we visited the solemn grounds where the former Origin Systems Inc building is located, and the team is currently working late into the night on future CIC updates. We also took a break to check out Robocop with in-theater pyrotechnics with the awesome Pix of Pix's Origin Adventures (be sure to check out his website!). The first picture below was taken in early 2004 just before Origin closed down, and the other two shots are from today. Also, here's a big shout out to the CIC staff members who couldn't be here but are hard at work around the globe! Do You Have Your Golden Ticket? Are you attending the RSI Live Event at GDC Austin? 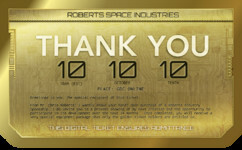 You'll need to present a Golden Ticket, which can be obtained at the Roberts Space Industries website. Be sure to get it by Wednesday. The ticket will also provide in-game perks in the future! 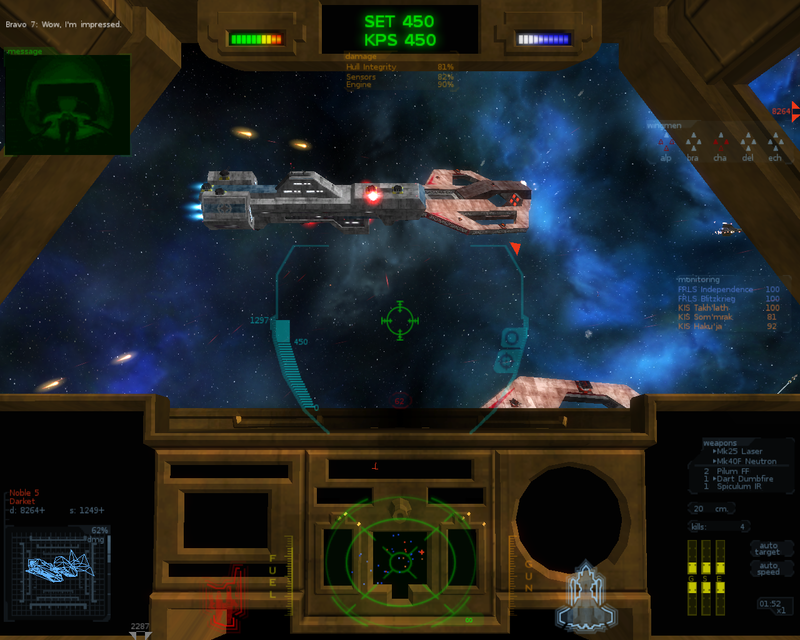 Chris Roberts, who helped define the space combat/trading genre in the 1990s with Wing Commander and Privateer is making his return to gaming with the announcement of an exciting new project at GDC Online. For PC Gamers, Chris Roberts and computer games are synonymous with quality and premium content. And this new venture will be no different. 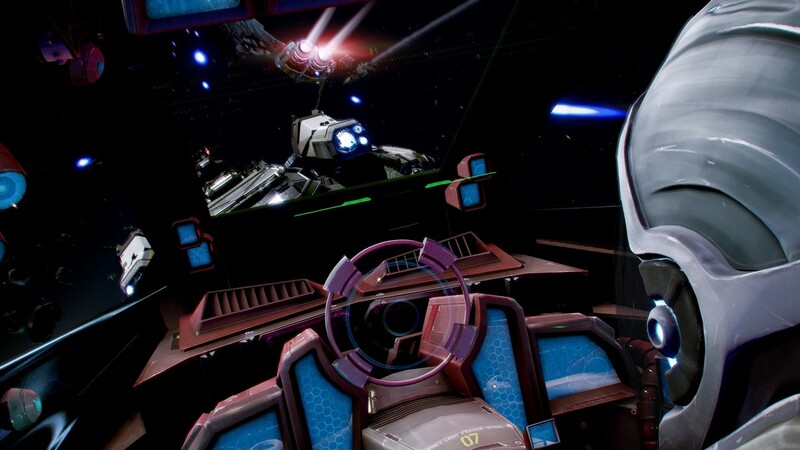 At GDC, Chris will demo a prototype of the new game and show off what it will be like to jump into the cockpit of the hottest looking new space fighter in the galaxy. Gaining entry to this event is easy. 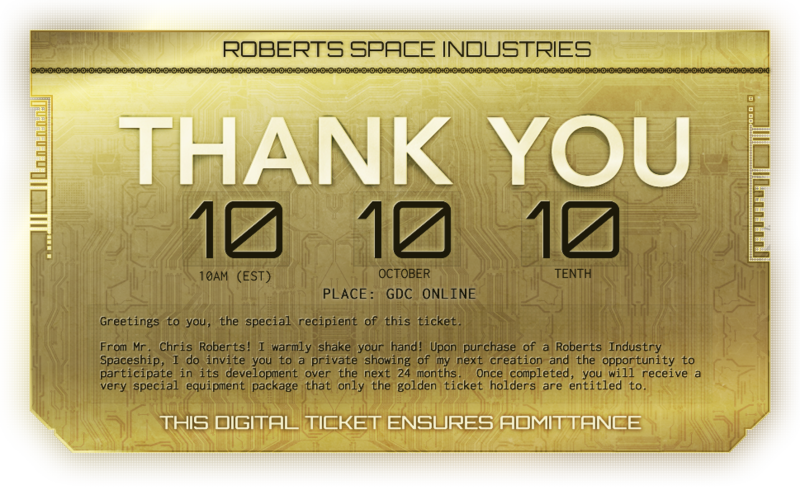 Just show your GDC Online badge or produce a Golden Ticket from Roberts Space Industries. You can find one at www.robertsspaceindustries.com. 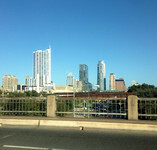 Can't make it to Austin? 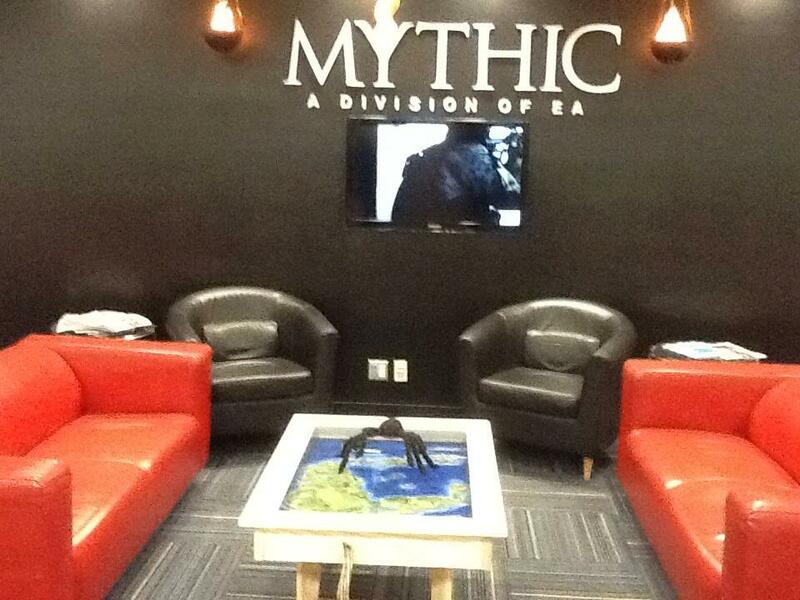 Gamespot will be streaming a live feed of the event here. 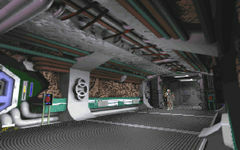 There's also a new fiction posting on the rising cost of the synthworld project: 2920: The Money Pit. With only 4 days left until the reveal, the Roberts Space Industries site encapsulates the events of 2872 in the latest fiction teaser. 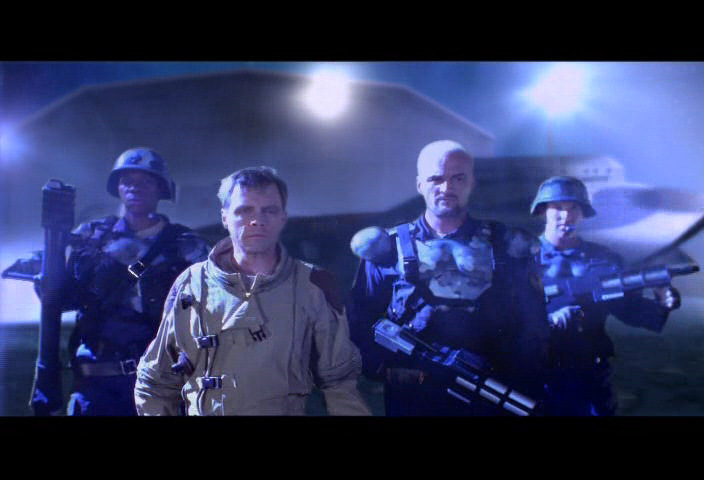 Meanwhile, LOAF, Chris, ace, and Blonde have arrived at Wing Commander's place of origin! Already they've hunted for Wing Commander books at Half Price Books, had a bite to eat, and stopped for ice cream at the world famous Amy's Ice Cream and the adventure is just beginning as there's an exciting week of events ahead. 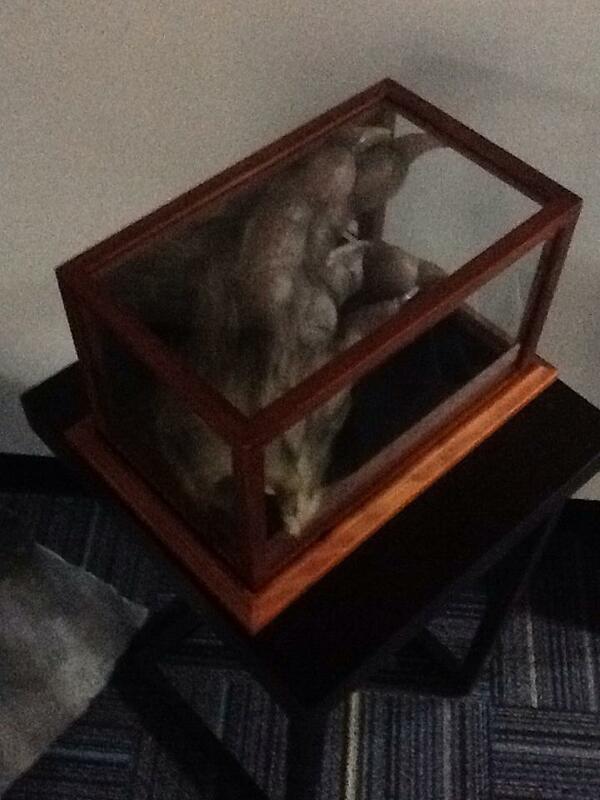 The current plans include a trip to the University of Texas to see some of the collected Origin material. They will also be donating various tapes and other material to the collection. 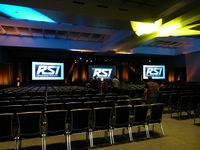 Along with meeting ex-Originites throughout the week, they will be attending the RSI event on Wednesday, doing various touristy activities, and visiting the old Origin building after which they will return home on Saturday! 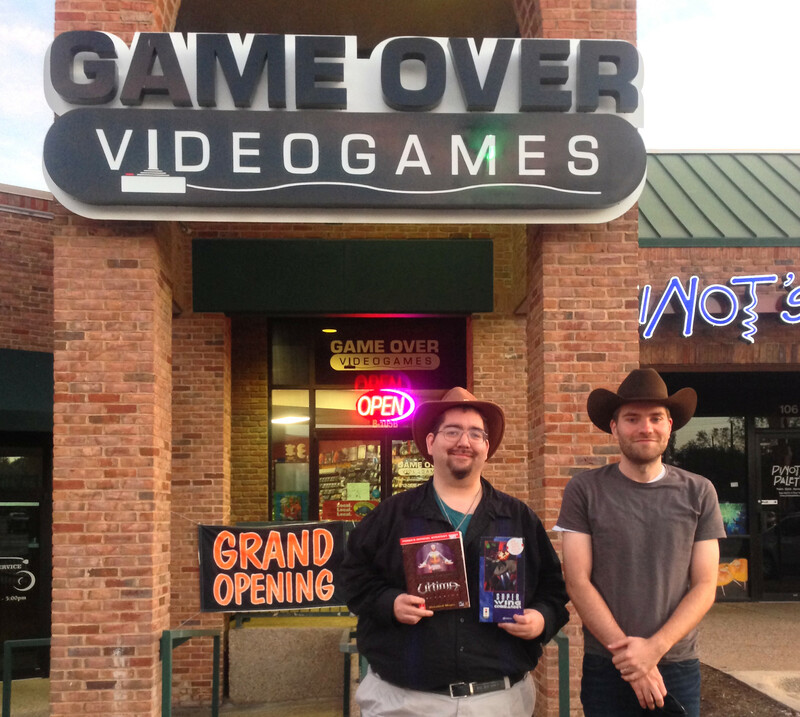 As we edge closer to the big October 10th RSI reveal of Chris Roberts' new game project, LOAF and Chris are preparing to head to Austin for the much anticipated event as well as various Wing Commander related adventures. Meanwhile the Roberts Space Industries site updates continue unabated with a commlink article reminding people about RSI's various social media accounts that you should all be following including Twitter, Google+, Facebook, and Tumblr. While you are at it, don't forget to follow us at the CIC as well. You can find our Twitter account here, and our facebook page here! 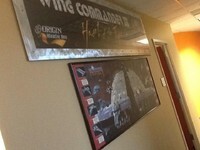 Further, the RSI Museum expands with a exhibit featuring another of Chris Robert's pre Wing Commander games: Bad Blood. The latest time capsule also pushes us into the 29th century. Now that the tide has risen, mankind has collaborated with other species to create the "Ark" in the hopes of fostering peace in the galaxy. 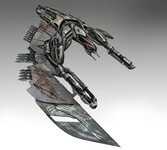 Cybot's built yet another ship, and this one comes from a new faction - the Firekkans. 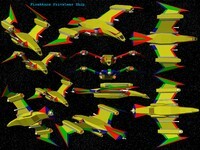 He's taken their birdlike species are patterned a space fighter after them. Copying avian traits so directly could be a bit too obvious, but the design is still pretty cool. 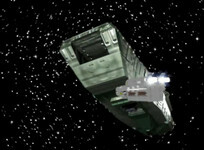 You can read more on the design and grab the model for yourself t the CIC Forums here and here. 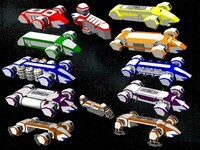 NinjaLA has been closely following the various concept art designs that have surfaced at Roberts Space Industries, and he's noticed some of the same ships have appeared from different angles. One fighter design in particular has made frequent appearances, and it has the honor of being featured in the very first fan art for the game. 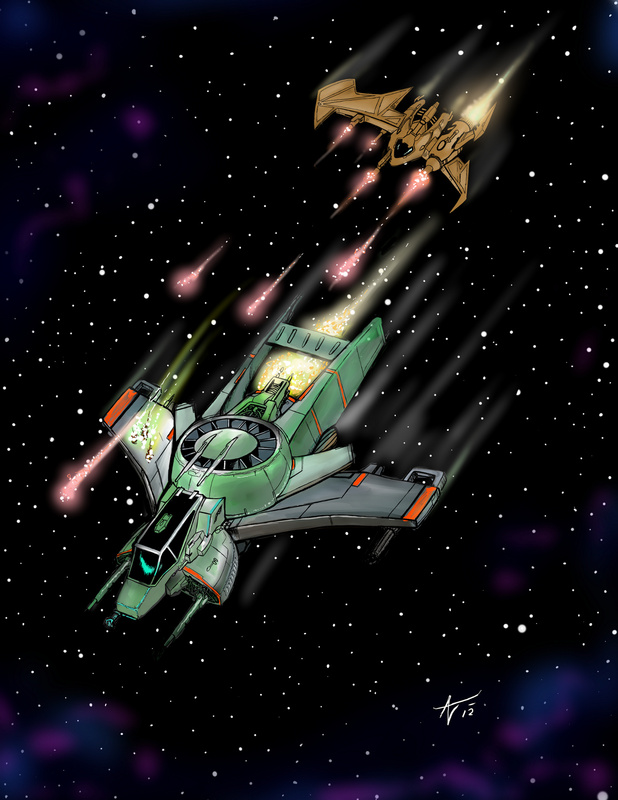 It happens to be under fire from a Kilrathi ship in this image. Also on the RSI page, there's a new fiction teaser, 2795: A Kinder, Gentler Human, with a new take on the Prime Directive. 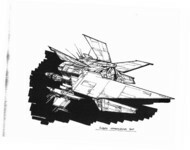 The latest Roberts Space Industries posting is a concept art drawing of the Kilrathi Comcon from the Wing Commander Movie. 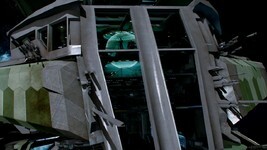 There's also some background information on what else the ship was used for in the film. 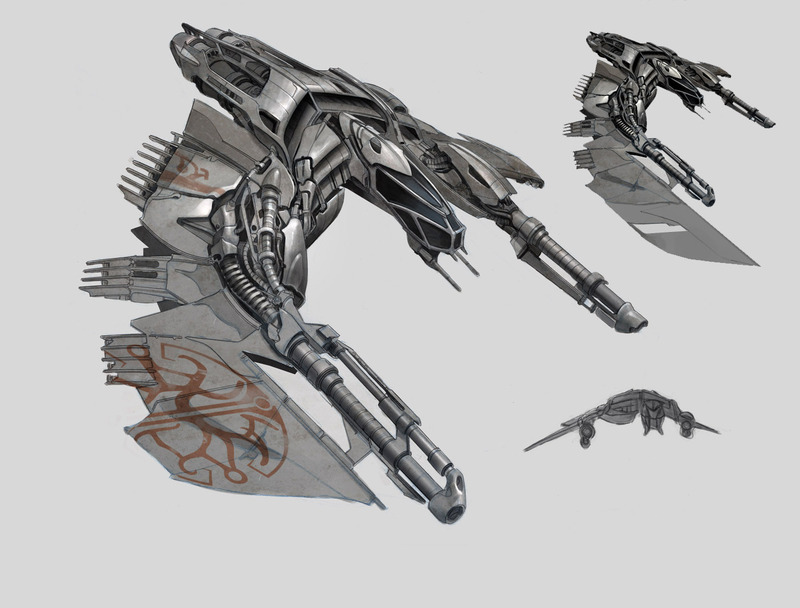 The Thrak'hra class design is very eye-catching, and it's certainly one of the most imposing reconnaissance craft out there. 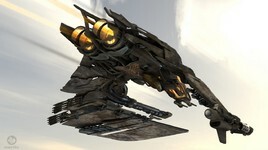 It even seems to share quite a bit of style in common with kat ships from the games. 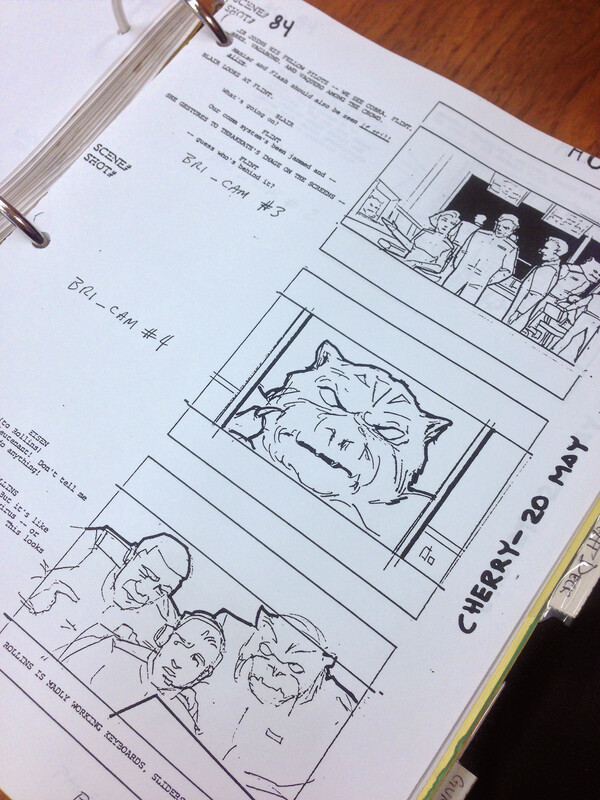 You can find more early sketches of the Comcon in our archives here - the final design is much closer to today's sketch than the original storyboards. 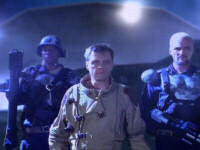 In the original movie as shot, the concom is the setting for the film’s climactic showdown, a knife fight between Blair, Gerald and a Pilgrim traitor revealed to be Admiral Wilson of Pegasus station. Test audiences found the reveal confusing and Wilson’s role was removed from the finished movie. 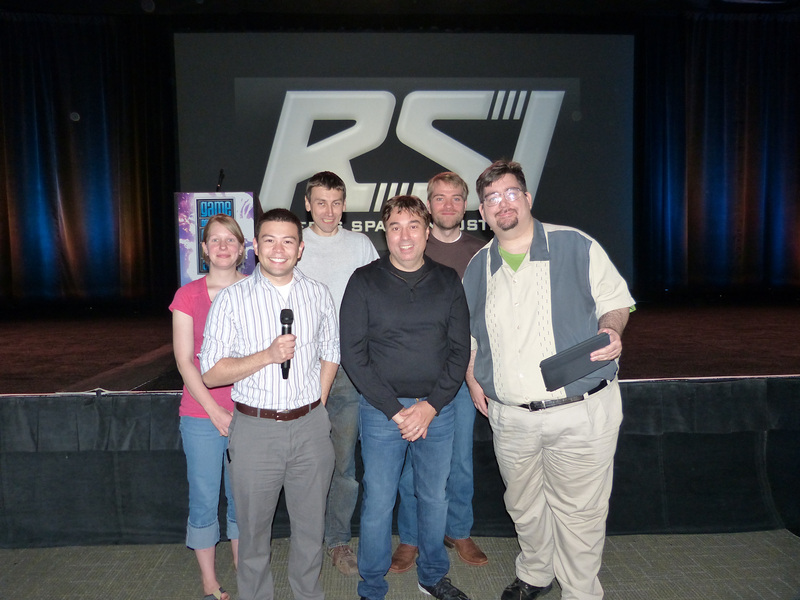 In other RSI news, there's a new poll that asks about Your First Chris Roberts Game. It starts with Times of Lore and Bad Blood and goes all the way to Freelancer. 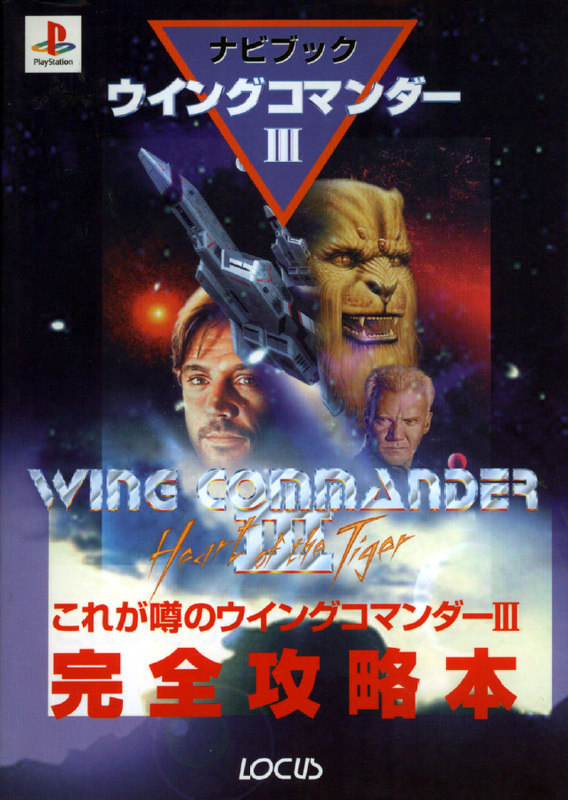 The winner so far is the original Wing Commander. Freelancer is in second with a surprisingly huge margin over Starlancer. Today's fiction teaser, 2792: The Tide Rises, highlights the fall of a human dictator. 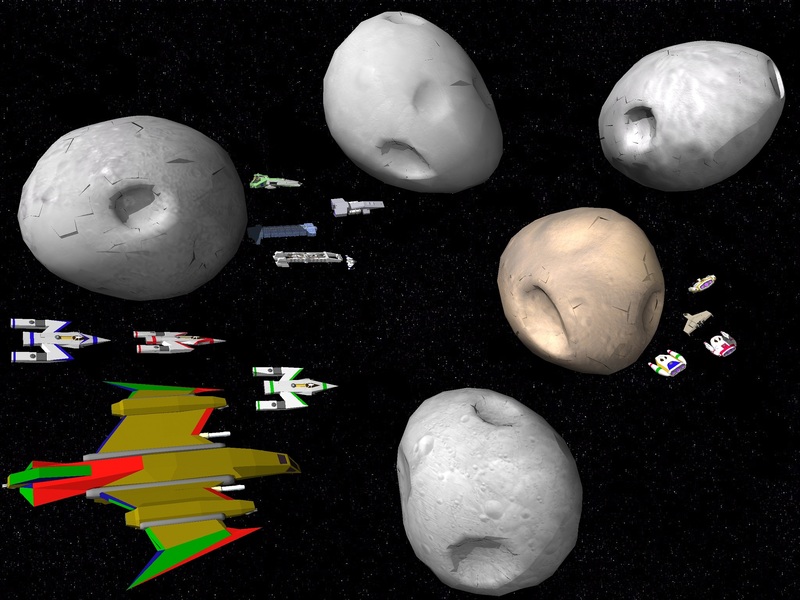 It's been another productive month for capi's Wing Commander RPG. The project's website/wiki has gotten a clean overhaul, and its weekly updates have demonstrated steady progress. Since mid August or so, capi estimates that the project has gone from about 80% to more than 95% complete. There's not much left! A huge new section that's been filled in with tons of info is the Who's Who profile - check it out! This week was largely spent gathering information for Chapter 12.2 (Who's Who in the WC Universe). After finishing up the Glossary and Acronym Key in Appendix Three (rounding out the Appendices) on Tuesday, I set myself to the task of finalizing the character list, making sure I had correct ranking information for the various time periods, and gathering up data from their WCPedia and CIC Encyclopedia entries (incidentally, I'm finding that with the exception of Privateer 2 the character entries at WCPedia are seriously lacking, an area I may turn my attention to with that project once I get an opportunity). The final list is 197 characters, some of which are repeats over time (people like Blair, Tolwyn, Maniac, Paladin, etc.). I still have 76 characters for which I need to put in basic information. No stats are available yet; that'll be the easy part of the work that has to be done. The Roberts Space Industries updates continue as the clock ticks down towards the big reveal. 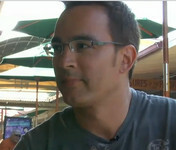 Today sees a Commlink post about yesterday's Gamespot interview and Chris Roberts interview. "The inter-system Comms absolutely lit up. People thought it was a joke. Maybe some Activist cracked the NewsOrgs? Wouldn’t be the first time." 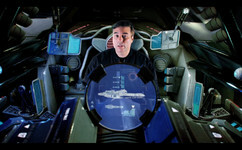 Gamespot has conducted a new interview with Wing Commander creator Chris Roberts. In it, they discuss Roberts' motivations for reentering the game industry and his visions for what's to come. Some of the answers mirror what he first mentioned during the CIC 14th Birthday Party in August. Gamespot has also posted a teaser trailer that features a brief glimpse at a few space fighters! 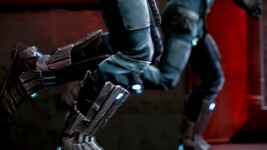 Roberts said that the project's visuals may be slightly ahead of what next-generation consoles from Microsoft and Sony will offer, and this visual prowess has always been an aim for the developer. 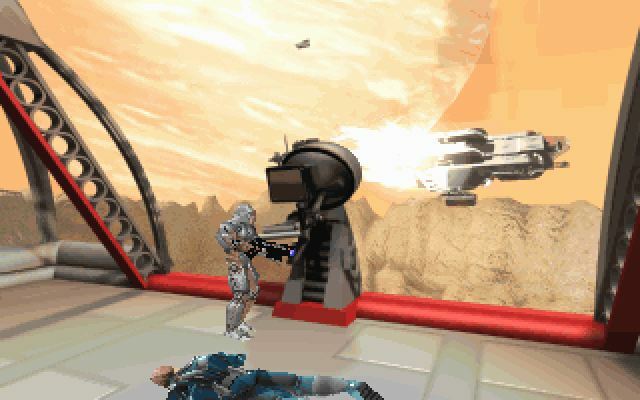 "I want to get back to the roots of what I did in the old days with Wing Commander, which was, if you've got a really badass PC, this is going to show it off," he said. One way in which Roberts' new game will leverage current technology is through its use of an online component. 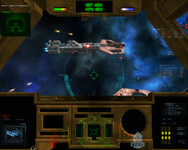 He said his new game will allow the community to connect in ways that Wing Commander or Freelancer players never could. Commlink article - It’s Almost Time! 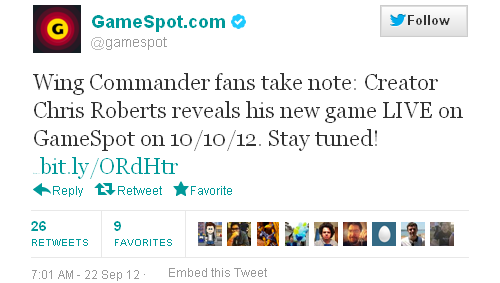 GameSpot also recently announced via Twitter that they will be covering Chris Roberts' announcement live on October 10. Sounds like it'll be a very interesting day! 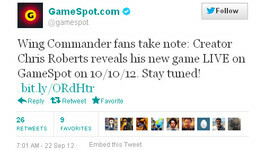 Wing Commander fans take note: Creator Chris Roberts reveals his new game LIVE on GameSpot on 10/10/12. Stay tuned!